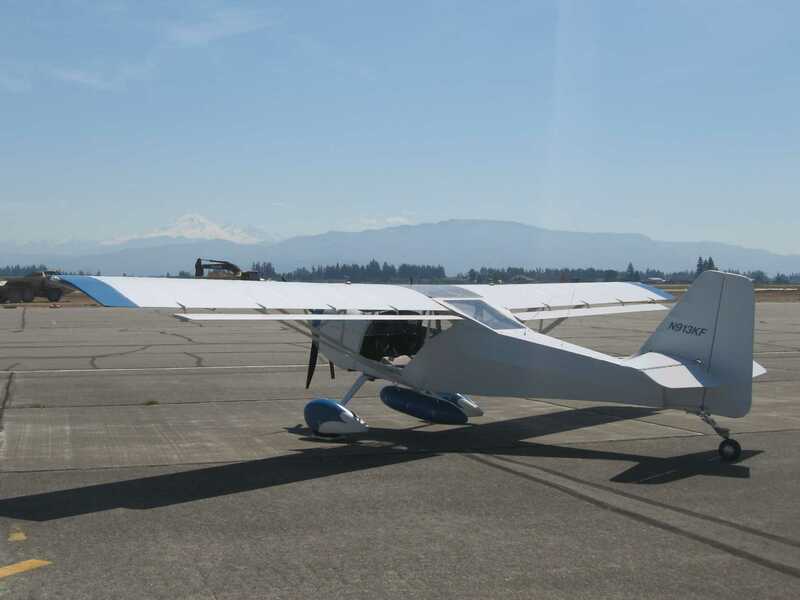 Preparation for a flight in the Kitfox from Denver, to Arlington Washington, through Canada, and on to Alaska began months before the actual flight. I planned to depart on July 6 or 7 so that I could visit the Arlington Fly-In. The route that I chose would be about 2600 miles from my home airport in Denver (Front Range - FTG) to Anchorage. The route that I picked to come home would be about 2300 miles. I had a desire to make it to Merrill field in Anchorage, but decided early on that the destination was not as important as the journey. I refused to set hard schedules so that I could adjust to the vagaries of wind and weather. I consulted AOPA for guidance on the legal requirements and procedures. I researched routes on the internet. I learned about the differences of flying through Canadian airspace. I then began to assemble the things that I would need. First I addressed the logistics for the airplane. I needed a survival kit - it is mandated by Canadian and Alaska law. I purchased a commercially assembled kit. 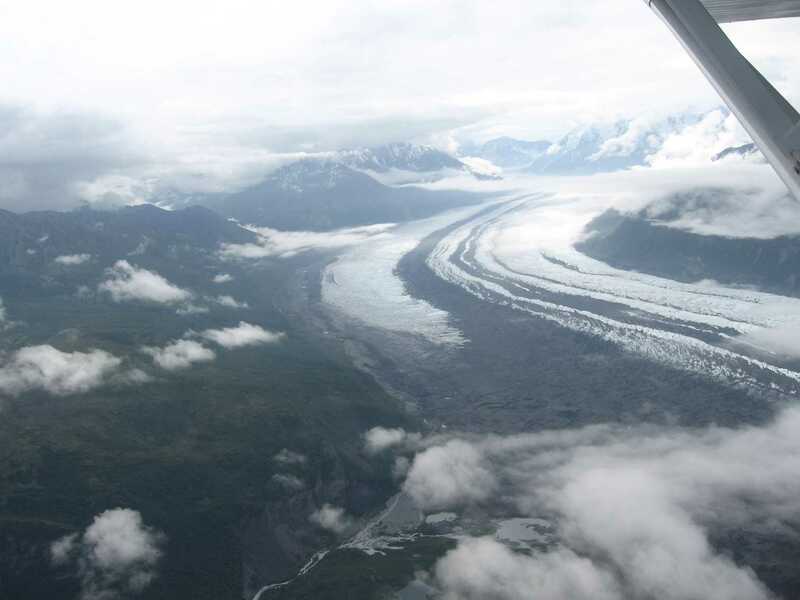 Once upon a time, Alaska required that you carry a firearm in the aircraft. This is no longer a requirement. If someone does choose to carry a firearm, it cannot be a handgun if you will be flying in Canada. A rifle or a shotgun is permitted in Canada, but a separate permit is required. I decided not to take a firearm. I bought a Personal Locator Beacon just in case I had to make an emergency landing in the middle of nowhere. I purchased an external cargo pod for the Kitfox to carry my camping gear. I had camped before at Oshkosh, but this was going to be a two plus week trip. I supplemented my existing gear (tent, sleeping bag, stove, etc.) with a new self inflating sleeping pad. I already had my tool kit, tie downs, canopy cover, and folding chair. I replaced my Lowrance Airmap 500 GPS with an Airmap 600 and a fresh database. Then I carried the 500 as a spare. A 406mhz ELT is not yet required in Canada, but rumor says that it soon will be. I still have a 121.5mhz ELT. Then there was the paperwork. 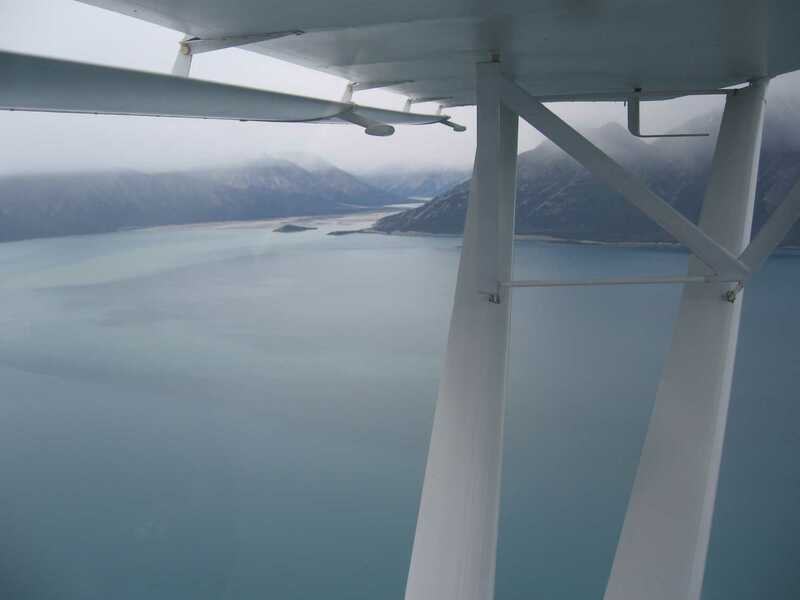 The Kitfox needed an FCC Radio Station License for international travel. This used to be required for all aircraft but is no longer needed if you will be staying in the USA. $110 later that was done. I was lucky that I still had my Restricted Radio Operators Certificate issued by the FCC from my beginning flight training in 1976. It also used to be required but is now only needed if flying internationally. I had to get my pilot certificate reissued with an endorsement that I was English Language Proficient ($2). I had to print a copy of my aircraft insurance which showed that I was covered for liability in Canada. I printed out an endorsement from the Canadian authorities which permitted an experimental aircraft to enter their country. I had to get an annual Customs and Border (US) sticker for the aircraft at a cost of $27. I had to establish an account on the EAPIS (Electronic Advanced Passenger Information System) system. I already had a passport, medical, aircraft registration, operating limits, airworthiness certificate, and picture ID. Oh yes - do not forget cash and a Visa card. The Denver weather was wet and raining. 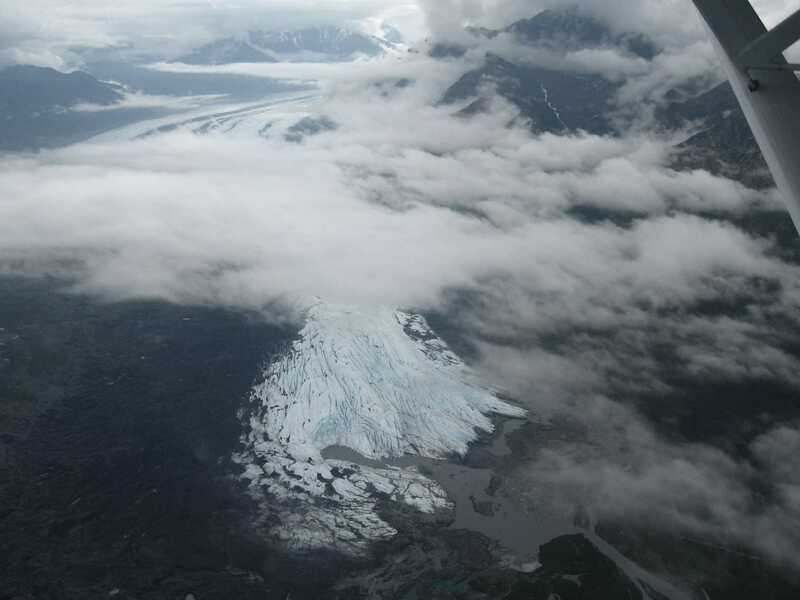 I expected this for my arrival into Alaska, but to face it on the first day of the trip was unusual. I was anxious to go, but tempered the desire with common sense. The Kitfox was packed at the hangar, so I kissed my wife and drove to the airport to wait out the rain and fog. IFR weather prevailed until about mid-morning. The visibility finally lifted enough that I was able to head east from FTG then turn north. My planned route of flight was to cross Cheyenne Wyoming then turn west towards Laramie. As I approached Cheyenne, the rain intensified. I checked the weather and found that there was no way that I would be able to negotiate the route to Laramie in VFR conditions. 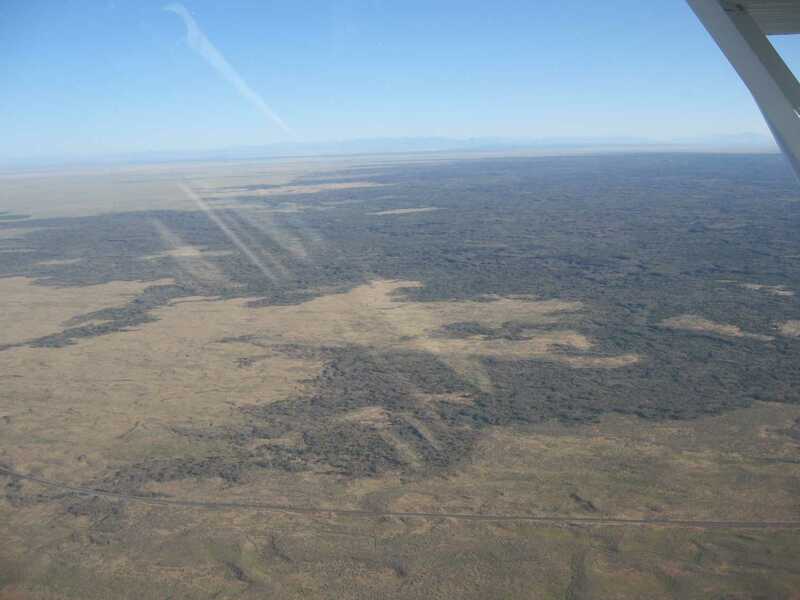 As my visibility dropped, I descended to 500' and flew north until I intercepted I-80 east of Cheyenne. I then turned right and followed the highway to Pine Bluff where I landed to wait out the weather. The pilot shack had a chair where I sat, read a book, and ate the sandwich that I had prepared at home prior to leaving. I was visited by two separate local pilots who stopped by because they noticed a strange airplane tied down on the ramp. We talked about the airplanes that they owned and the building of the Kitfox. I was offered a ride into town, but declined so that I could be ready if the weather improved. It was a pretty inauspicious beginning. I was barely 100 miles from home on a 2600 mile (one direction) trip. Would I be stopped short and return to Denver for the night? The next day's forecast for that region was even worse. The weather in central Wyoming was reported to be much better than where I was sitting, so I made plans to alter my route and fly towards Casper. I gave serious thought to just continuing straight north to Canada and forgoing the side trip to the Arlington Fly-In, but I really wanted to see that part of the country. Heavy rain lasted for about four hours before it finally began to lift. I took off, flew low, and joined a railroad track northbound. The weather continued to improve until I could turn west near Laramie Peak. Once I made it into the Medicine Bow area, the weather was great. I was already about six hours behind my anticipated schedule, so I knew that I would have to stop for the night instead of flying a marathon day into Arlington. I stopped for gas at Rock Springs, Wyoming and flew on to Preston, Idaho before the sun set. I had decided that I wanted to visit smaller airports on the trip as much as possible and avoid the large metropolitan areas. I was able to use the airport courtesy car to drive into town and get a room for the night. At only $58, this would be the cheapest accommodation (except for camping) on the whole journey. After the night in Preston, I got up early, checked the weather, and departed. There was not a single cloud in the sky for the whole day. I flew across southern Idaho and had to marvel at the lava fields. They are so barren and unforgiving. There are no roads or trails through the roughest country. The rest of southern Idaho is filled with agriculture. 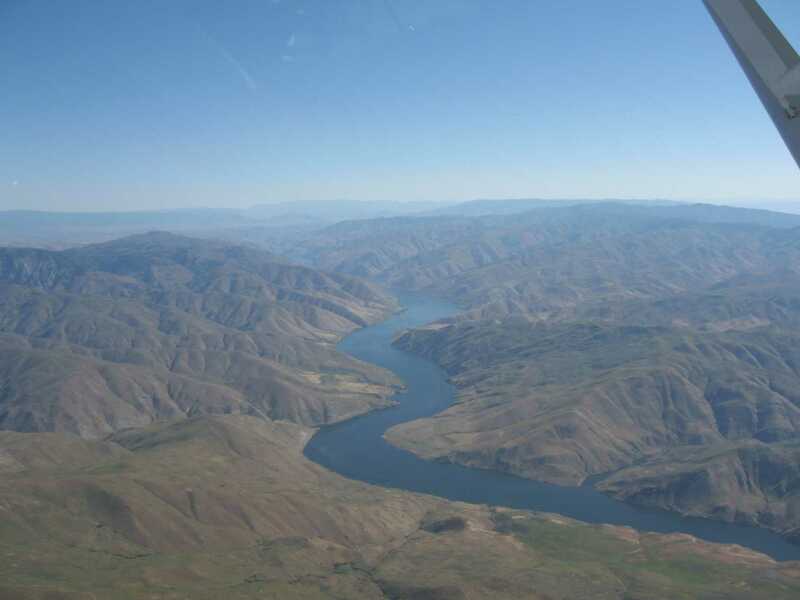 I flew directly over Boise and turned northwesterly along the Snake River. I was going to stop for fuel at Baker City Oregon, but I had enough to keep going and land in the Pendleton area. I stopped at a little airport in Hermiston, Oregon. There were a lot of agricultural spray planes coming and going. How can they afford a turbine powered aircraft to do that job? The weather was hot and sunny. I did not know that it was going to get hotter as I got to Arlington. 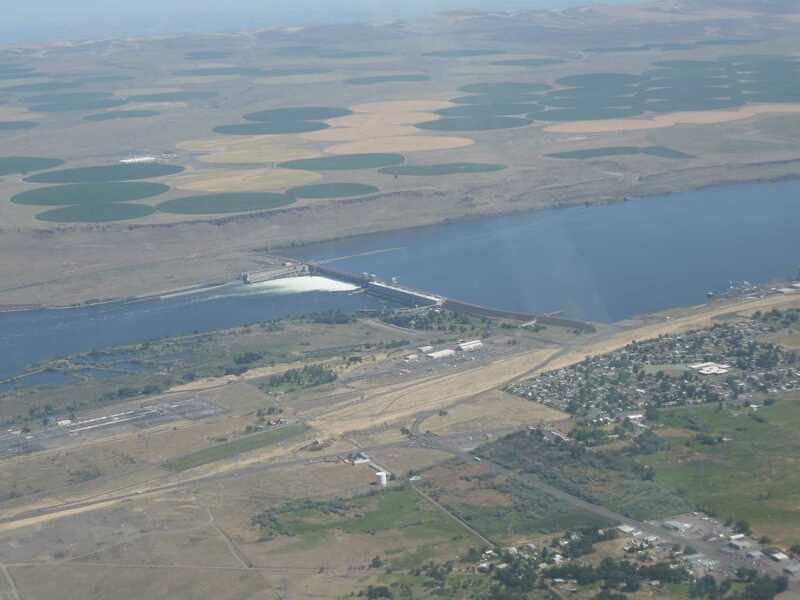 On climb out I crossed the Columbia river. I took a picture of the hydroelectric dam over the river and then looked up to see three snow covered volcanoes in the distance. 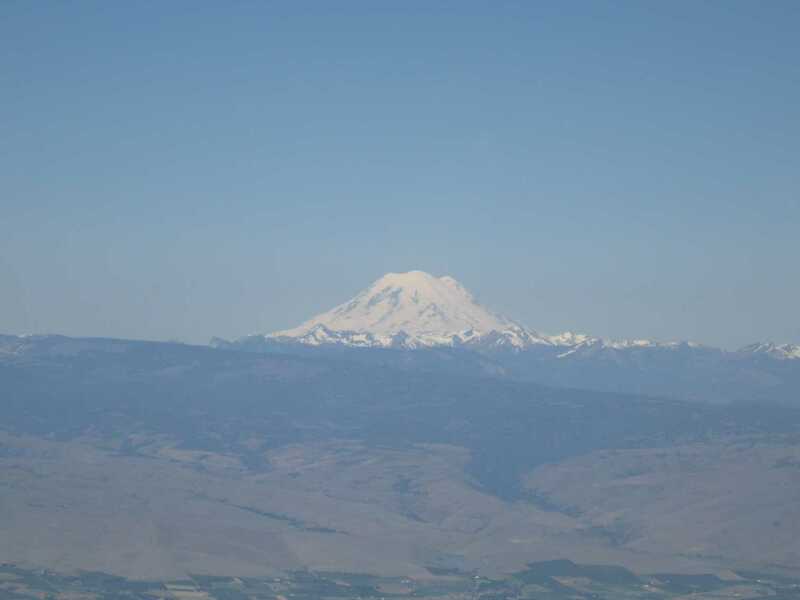 I would pass just north of one - Mount Ranier - as I approached Seattle. 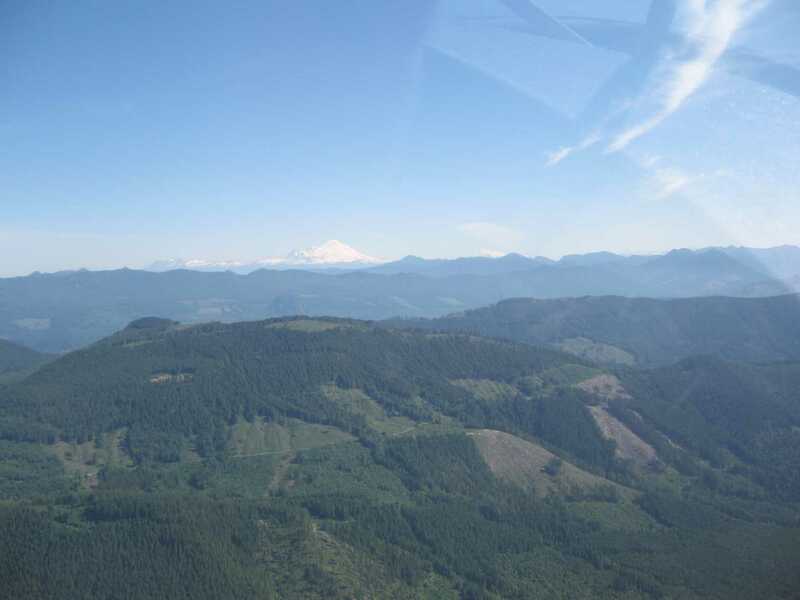 The last pass into the Seattle area was rough - both terrain and turbulence. As I approached Arlington, it was my friend Bill Copp who cleared me to land. Bill works with me at Denver TRACON and was working the temporary control tower at Arlington as a volunteer because he loves that kind of aviation. Bill has worked as a controller at Oshkosh, Sun-N-Fun, and with me at the Rocky Mountain Regional and Copperstate Fly-In. He will reach mandatory retirement age this year so this is his swan song. I think that one of the big reasons that he continued to work so long at Denver was because he had the ability to attend these special functions and feed his passion. The nice part is that he is good at it. I made it a point that every new controller that I brought into a Fly-In temporary tower got some personal instruction from Bill before working solo. For the last seven years this has provided me with success. It will not be the same without him. After the airplane was tied down (in the middle of nowhere) I walked through all of the exhibits. I knew the people at the Kitfox booth. I asked if they had a bottle of Decalin fuel additive to sell. This product is a lead scavenger which is added to 100LL fuel. They had not brought one, but when they found out that I was heading all the way to Alaska, John McBean gave me his bottle from his plane. He then told me to be sure to call him if I developed any problems on the trip. It is nice to do business with people like that. Bill Copp found me in the vendor area and we sat in the shade while the airshow was taking place. It was damn hot. Frankly, Bill and I both agree that we can do without seeing another airshow. They all look the same after a while. He invited me to come back with him to the temporary tower because he had to work until closing time at 8:00. I knew a few of the other controllers that were working at the tower so it was a good opportunity to renew acquaintances and meet some of the new people. I was so hot that I decided to try to get a hotel room instead of camping so that I could get a good night of sleep, a shower, and file my border crossing forms for departure the next day. I was anxious to keep moving. I managed to reserve a room at the Holiday Inn Express where Bill was staying. When the tower closed, Bill, Scott Stapp (another Denver controller), and I went out for a steak dinner. We talked shop and told lies so it was a good evening. We solved most of the FAA's problems during the evening. 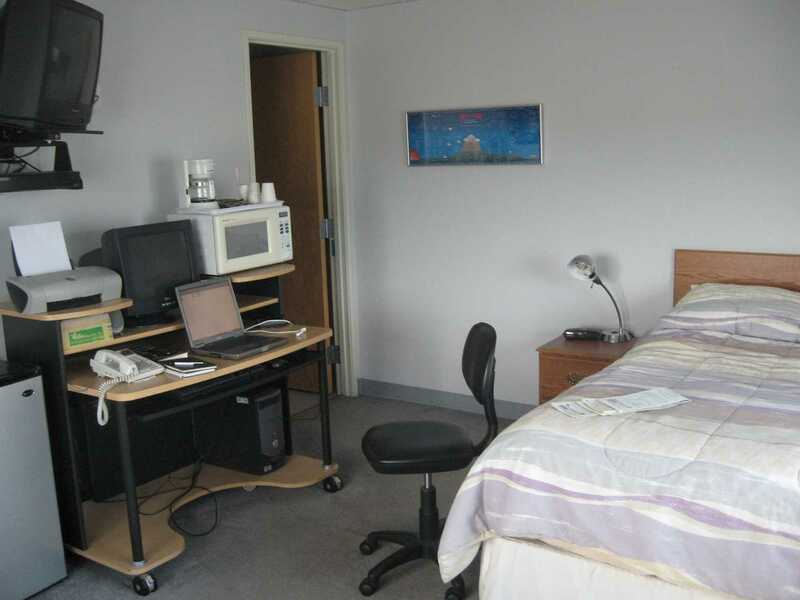 Back at the room, I filed my flight plan for the border crossing, filed my manifest with U.S. Customs, and called Canadian Customs to set up an arrival time. Then I slept. Bill had to be at the airport at 7:00 so I checked out of my room, had a cup of coffee, and rode with him back to the airport. The airplane tied next to mine was a Midget Mustang. Its owner had camped and he was a bit upset that we had been parked so far away from the other groups of planes out in the field. He had been all alone in that area and was unhappy that there was nobody to socialize with. I agreed with him. I untied the airplane and got it ready to depart. 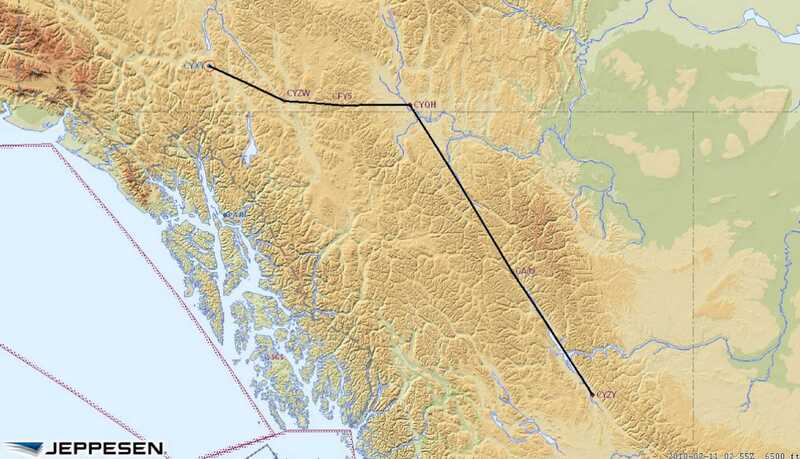 I had filed a flight plan to leave at 10:30 for the short flight to Abbottsford BC. It was only about 50 miles. I told Canadian customs that I would arrive at 11:10. They had told me that if I could not arrive in a window 15 minutes prior to 15 minutes after that time I would have to contact them. I taxied out a little early and got airborne. I had to waste about 20 minutes, so I circled around looking at the scenery. I called flight service to open my flight plan (required for the border crossing) and they issued me a transponder code. Away I went. The arrival at Abbottsford was uneventful. The airport has a lot of construction occurring, so there are a lot of taxiways closed. The tower helped me get to the customs box (literally a box painted on the ramp). 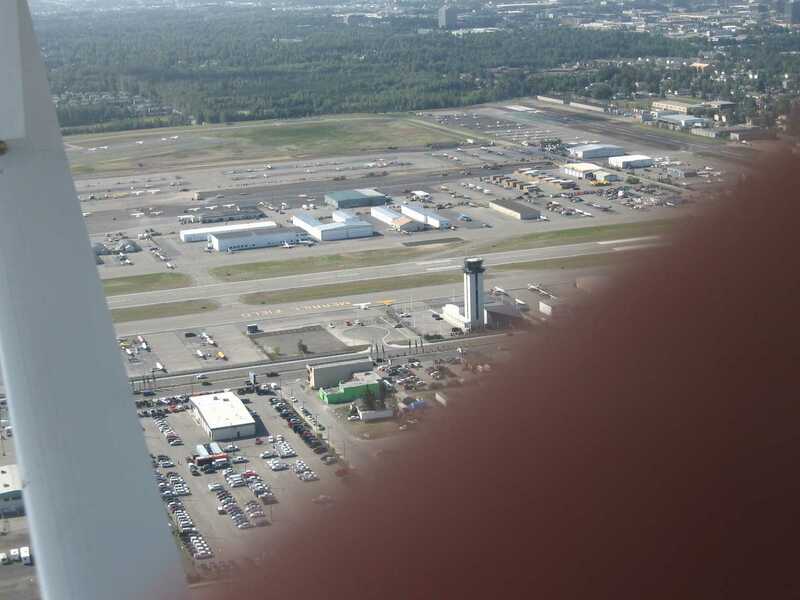 You are not supposed to get out of your airplane until customs arrives, but the tower was helpful and said that if I had a cell phone I could call CanPass and they might just clear me over the phone. I did and they did. Just a phone call and it was done. I didn't have to wait for an agent, show my passport, or produce any of the other paperwork that I had so meticulously assembled. Who knew? I had lunch then it was time to file my flight plan. Flight plans are required for all flights in Canada. I confessed to the briefer that I had never filed a Canadian flight plan (at least not for about 30 years) and he was extremely polite and patient in helping me. Now the anxiety began to creep in. I was a bit apprehensive about heading out over the wilderness. I actually had to take some time to convince myself to keep going. I am glad that I did. 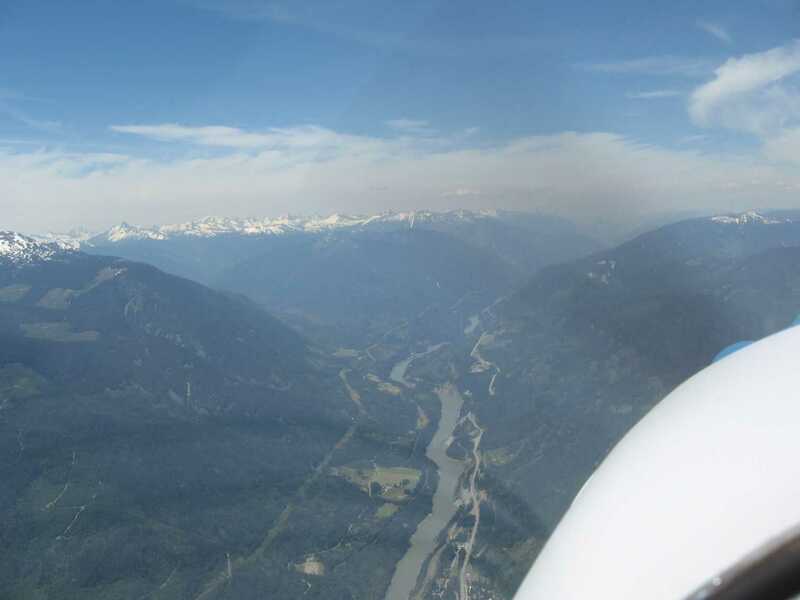 The flight out of Abbottsford through Hope and Lytton went through perhaps the most beautiful country that I have ever flown through. High jagged mountains on both sides with plenty of snow capped peaks and deep blue lakes made it spectacular. The mountains became a bit less imposing after Lytton, but boy was it sparsely populated. 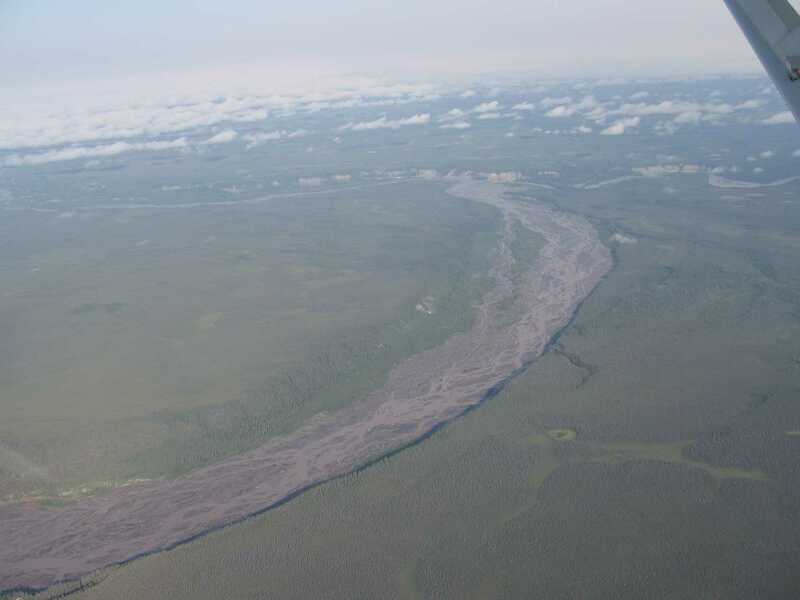 Most of the areas that I flew over had been used for logging. 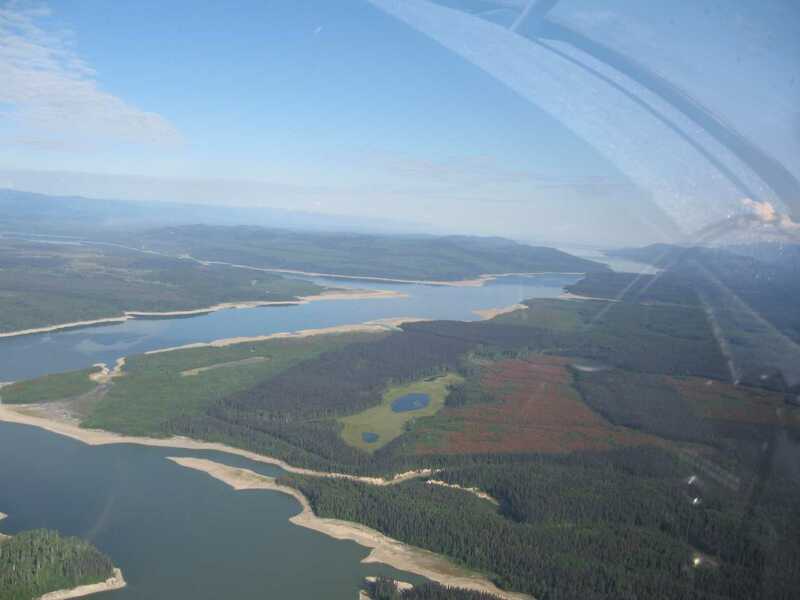 There was one very big mine between Williams Lake and Quesnel that I was told was gold and copper. 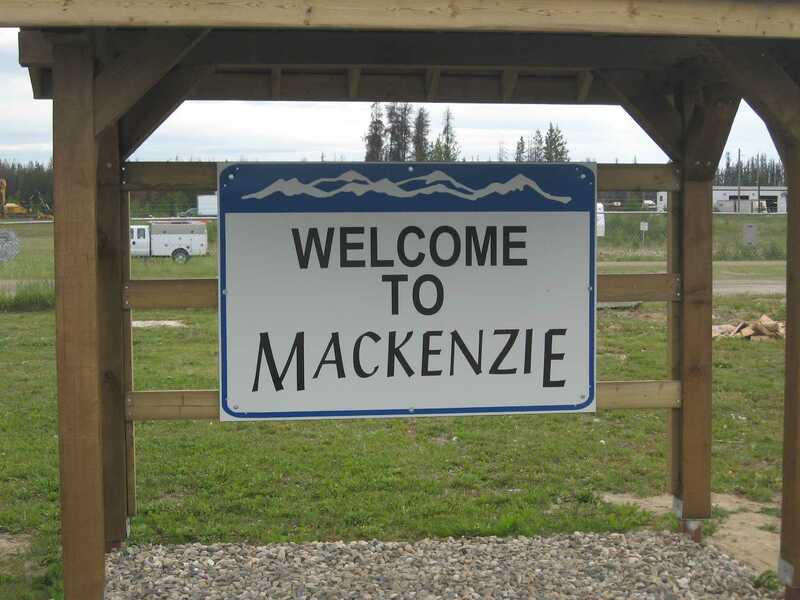 The headwind picked up near Prince George so I had to amend my arrival time at Mackenzie. I finally landed after 4:35 of flying. 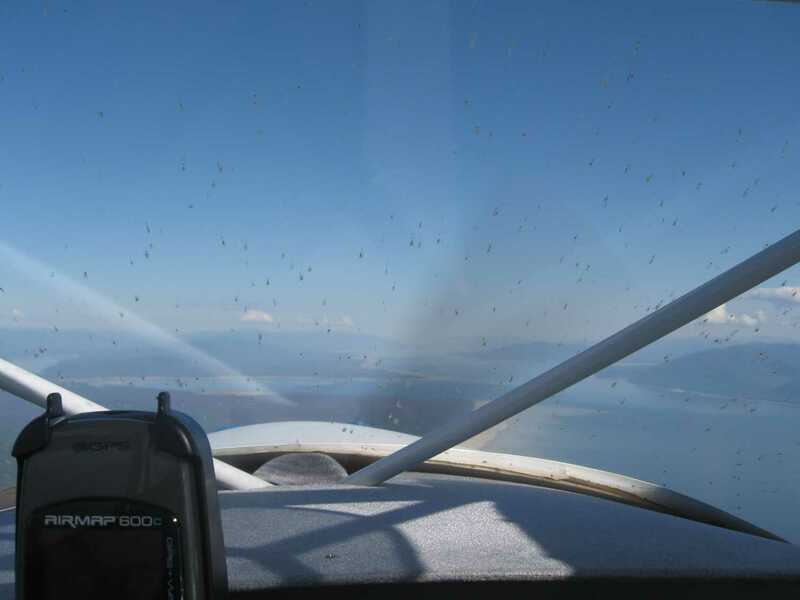 As I was on final, I flew through such a thick area of little green bugs that I almost could not see out my window. They were splattered everywhere. It was disgusting. When I arrived on the ramp, nobody was around. A local pilot showed up and called the lady that ran the fuel concession. She came out to the airport, showed me where to tie down, said that it would be OK to camp, and gave me a free beer. Wow. So I drank the beer, secured the airplane, pitched the tent, and cleaned the bugs off the windshield and leading edges. I cooked a hearty dinner of canned beef stew. As I finish this paragraph, the sun is just setting (10:45) and I am ready to sleep. Camping worked well. I woke up about 7:00. There had been some light rain during the night, but nothing serious. I made coffee at the camp stove then packed everything up. Vicky, the fuel sales lady who had given me the free beer the night before, was already at the airport. I sat and talked to her for about an hour. She was 61, divorced, and had been in Mackenzie since 1982. She had worked dozens of jobs, many concurrently, such as nurse, fuel sales, dispatcher, FBO owner, fire watch, communications installer, and more that I can't recall. She wanted to talk so I heard all about the problems with the economy, Canada health care, unions, aboriginal issues, the local lumber industry, the fuel sales business, and mining. It was actually a very enjoyable conversation over a cup of coffee. Fuel in Canada is sold in liters. Do not get too excited when you see that the price is only $1.58. That price is per liter, not per gallon. Although fuel in Mackenzie was almost $6.00 per gallon, this was the last place that I could get any for over 350 miles. I took off at 8:45 and headed up the Trench. The Trench is geographic fault line that runs strait as an arrow. It is a very sparsely populated route of almost 400 miles. The first 150 miles of the route is over Williston Lake. This is a man-made lake that, I was told, is the largest lake in British Columbia. Then the terrain changed to rough, tall mountains on each side. For most of the route, there was no road or river below. There were a couple of native villages about 150 miles up the Trench that had dirt airstrips. Emergency fuel was available at one or two of those strips. 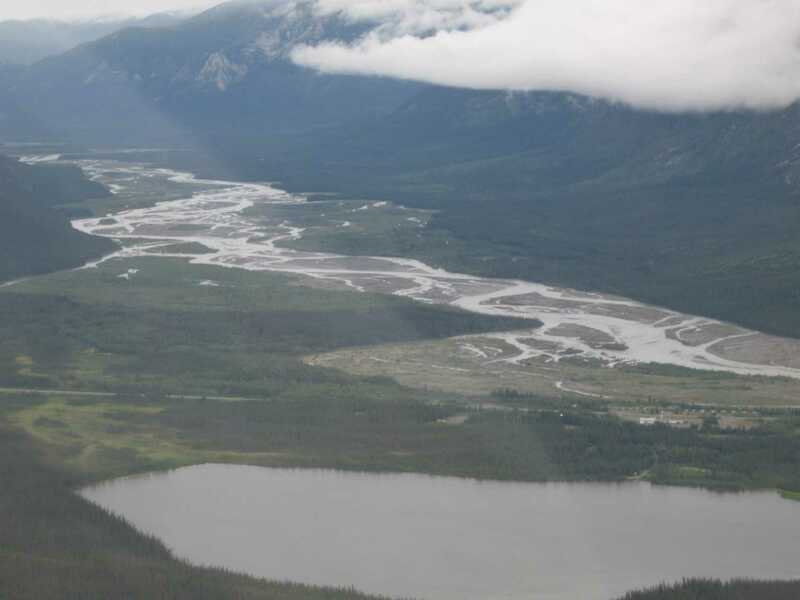 Other than that, all the way to Watson Lake the ground below was covered by thick forest. There were often times when there were absolutely no likely emergency landing spots in the event of an engine failure. What a huge country. I found myself using the latitude and longitude hashes on the GPS to keep an accurate position as I followed along on the chart. There are so many small lakes in these mountains that they are hard to accurately identify. The big ones - and there are plenty - are easy. I wish that I had floats on the Kitfox. I would be tempted to stop. After 3 hours and 37 minutes I landed at Watson Lake, Yukon. This is where I join the Alaska Highway. The airfield had been used during World War II as a stop for warplanes that were being delivered to Russia. I stopped for gas and spent some time in the terminal building looking at all the historic pictures of the wartime operations. I signed the guest book and noticed that a few lines above my signature were two pilots from my local airport, Lothar Klingmueller and Carl Hahn. They has passed through about one month prior. Lothar was a fellow Young Eagle pilot from my EAA chapter. Its a small world. As I headed west along the highway, I felt reassured that I could land anywhere on the road if I needed to. It would make a great emergency runway. There were no power lines, no billboards, a paved surface, and very little traffic. It also was great to navigate over. This was really useful when, about 75 miles west of Watson Lake, I had to fly through several areas of rain. By getting lower and keeping an eye on the road, I was able to get through the area. 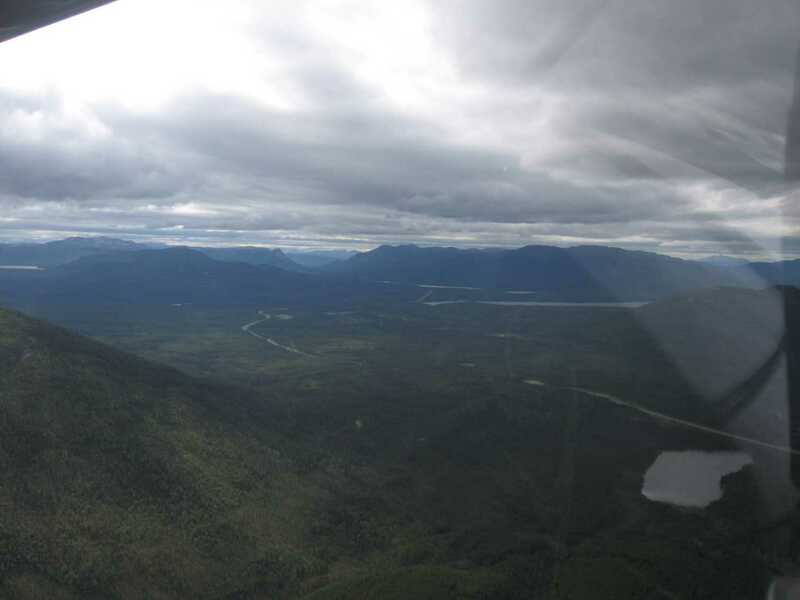 When I got to Whitehorse, the wind was gusting to 30 knots, but it was right down the runway. I was happy to get the airplane tied down and check into a hotel at the airport. The front desk clerk from the hotel was Swiss. I asked her how she had ended up in the Yukon. She told me that her husband was a helicopter pilot and she has followed him and had fallen in love with the territory. She and her husband had a photography business and took scenic photos throughout the area. The framed photos were displayed all through the hotel. I was able to exchange some US currency for Canadian currency and went to dinner. I went to the NavCanada Flight Information Center to get a briefing for the flight into Alaska. This is one of the last places you can get a walk-in face to face weather briefing in North America. What a professional operation! 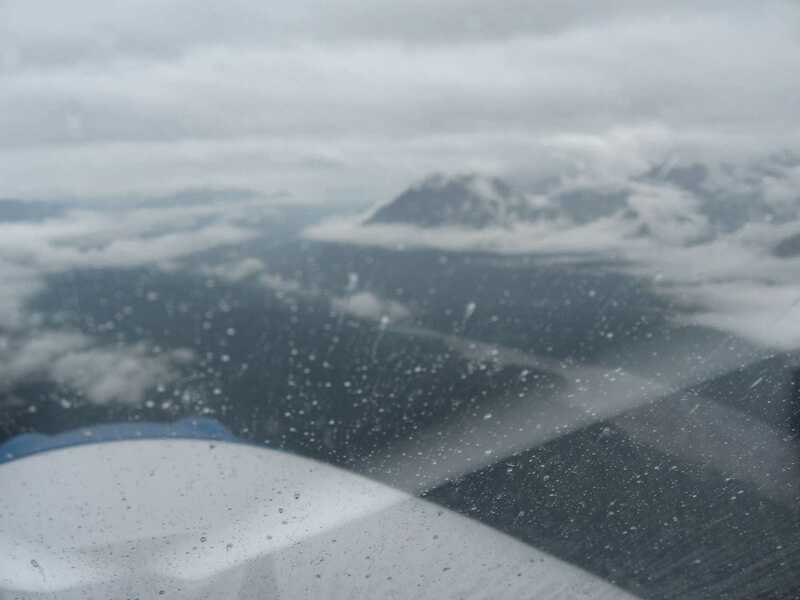 The briefer did a thorough job and it looked like there was going to be a lot of IFR weather once I was in Alaska. I stayed and chatted with him waiting for some of the weather reporting stations from Northway to Anchorage to open and issue reports. While we waited, I asked if there had been a lot of general aviation traffic flying between the lower 48 and Alaska. He said no, it was way down. He chalked it up to the economy and to the fact that so few young people were entering aviation. He surmised that the cost was too high for the benefit that a younger pilot might derive from the journey. It is sad. The briefer was also a pilot and he showed me some areas on the route where turbulence was likely. 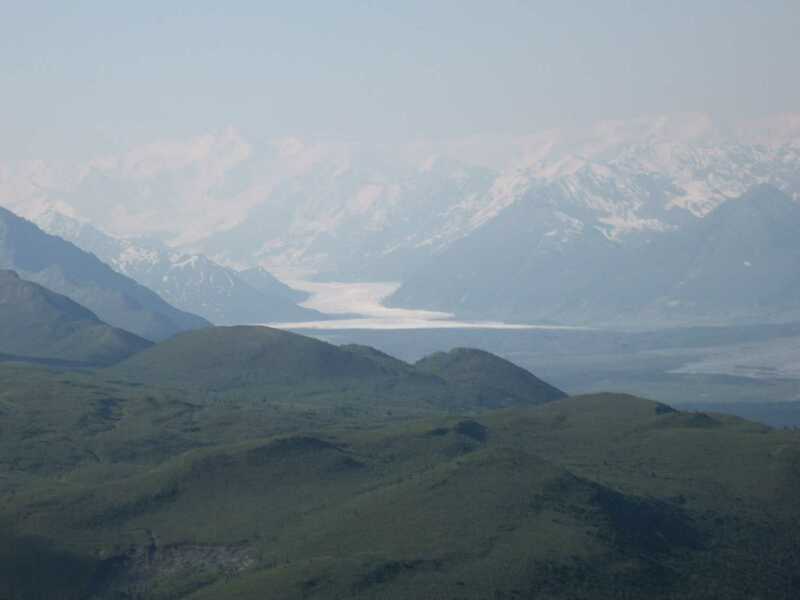 He warned me to stay over the lake (Kluane) as I approached Silver City because the strong winds coming out of the adjacent valley compounded by the refrigerated air coming off the glacier made it rough. (I later did as he said and had a good ride.) Finally the weather reports came. It looked like I could make it to Northway, but probably not through to Anchorage. All the mountain passes west of Northway were socked in with fog and rain. The fuel price at Whitehorse was $6.58 per gallon. This was the highest price that I ended up paying for the entire trip although Watson Lake was pretty close. I called Customs and left Whitehorse about 9:30. About the time I got to Burwash, it had begun to rain. The ceiling was pretty good and I had good forward visibility. Once again, I was glad for the comfort of the Alaska Highway below me. By the time I got to the US border - only 30 miles to go until Northway - the rain was moderate, visibility dropped, and the ceiling began to fall. I stayed right on the highway as I called Northway Radio for an airport advisory. They said that the airport had three miles visibility with moderate rain and ceiling 1200 feet. I was flying at about 400 feet. I think that the weather observer was being optimistic - it was more like a 700 foot ceiling and two miles of visibility. I let my GPS help me decide when to turn off the highway to align with the runway. Lo and behold - there was an airport! As soon as I touched down, the Flight Service observer changed the visibility to 1 and 3/4 miles in heavy rain. I landed just before the Customs inspector arrived. Maybe it was because of the rain, but all he asked to see was my passport, pilot license, and medical. We were done in less than two minutes. He said that he was expecting two more arrivals that day, but ultimately I was the only one who ever showed up. 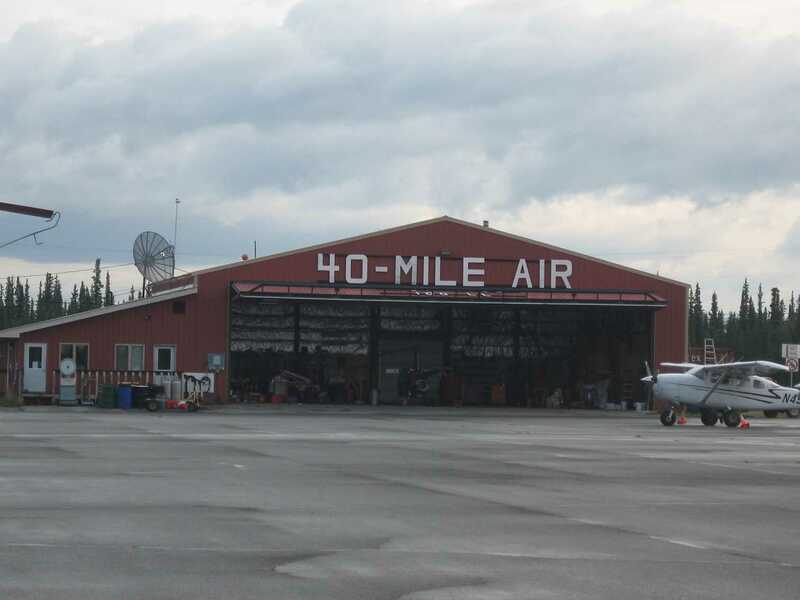 The Northway airport has Customs service and a Flight Service Station, but nothing else. The fuel sales company has decided to fold up the business because the state wanted them to perform an environmental clean up from 50 years of military and civilian use. They just quit instead. There was no fuel, no cell service, no pay phone, no restroom, no restaurant, and no hotels. Bummer! 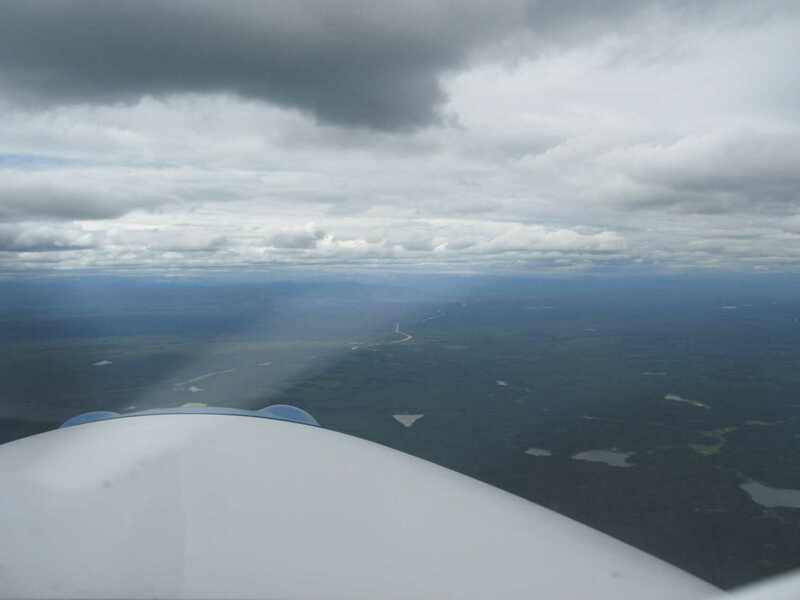 The weather had gotten even worse, so I decided to wait for it to improve then fly to Tok (35 miles up the highway) for the night. 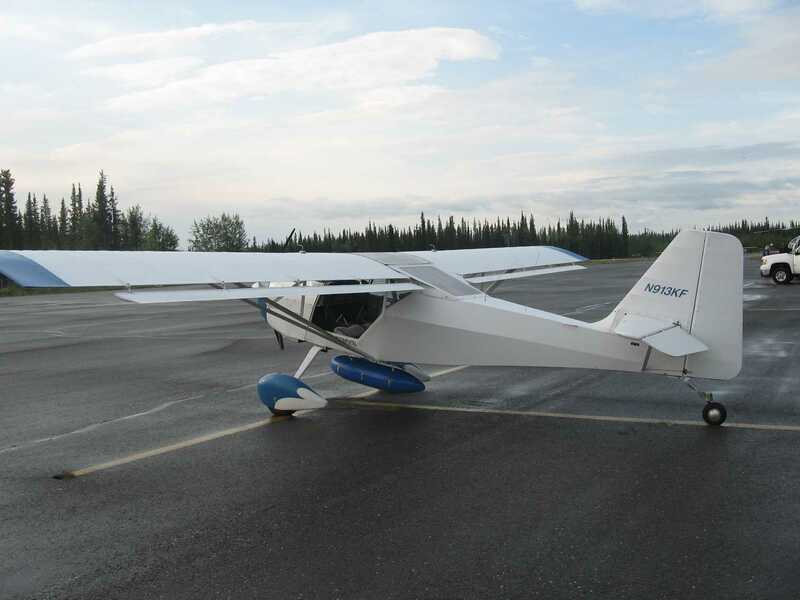 I went to the FSS to wait out the weather and found another pilot waiting to also go to Tok. He was a local pilot who had tried earlier in the day but the visibility was just too bad. I talked with the briefers and found out that they were both FAA employees. They actually lived in Fairbanks, but commuted to Northway to staff the facility when it was open in the summer months. They came for an eight day rotation then they got six days off. The FSS had apartments built into the building for them to live in. Apparently, there are a couple more stations just like that around the state. Both briefers had about 30 years of service, but neither was interested in retiring. The lady briefer had once worked in Worland and, since I had lived in Wyoming for several years, we talked of home. 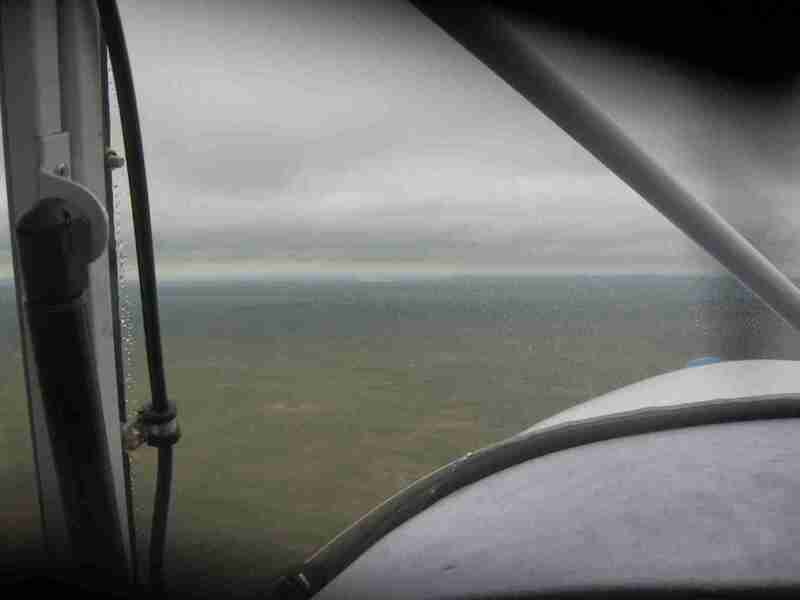 After several hours it looked like the visibility was lifting, so I climbed into the airplane. As soon as I did, the rain really began to pour. The visibility dropped to less than a mile. The temperature was 40. The rain drumming on the fabric of the airplane was loud. I sat in the plane, ate some jerky and trail mix, and read a book. I also spent time with a towel catching the drips that were entering the cockpit. Ultimately, I think that 2 to 3 inches of rain fell. There were standing lakes of water on the ramp and the areas between the runway and taxiway were flooded. Finally, the visibility got to three miles, the ceiling to 1400, and things looked brighter to the west. I left. The flight to Tok was pretty uneventful. Once I had gotten three or four miles from Northway, the visibility increased to about 10 miles. 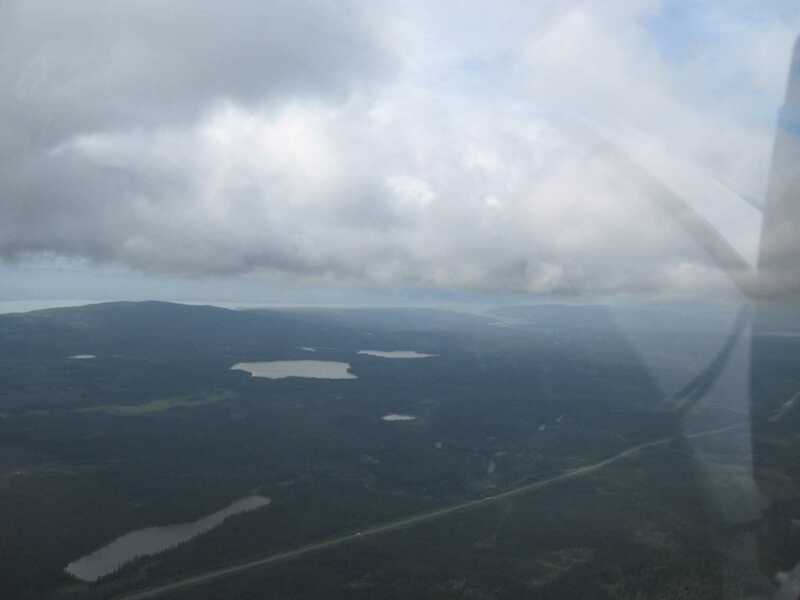 I had been warned to be careful for four large Loran antennas just east of Tok near the highway. The Loran system is no more, but the antennas are still there to trap the unwary pilot who blunders into them. 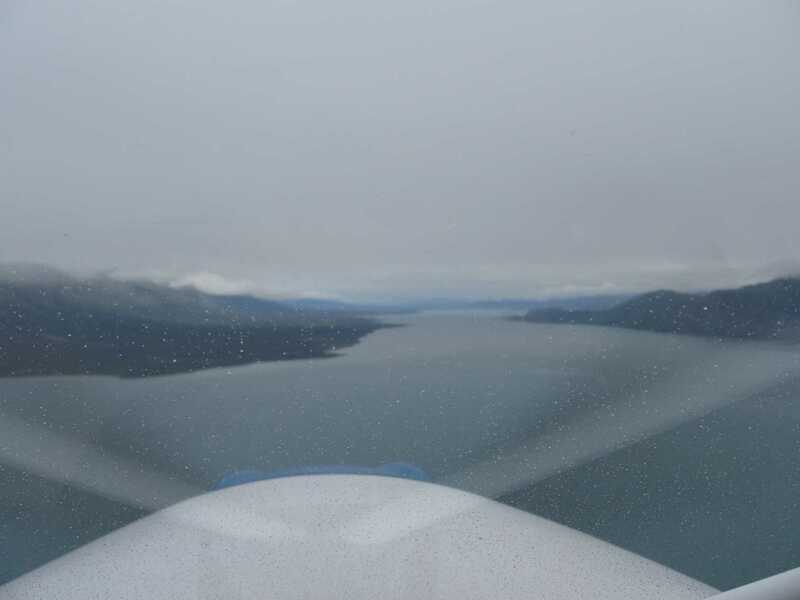 I landed behind a flight of two aircraft that were trying to go the other way and leave Alaska. They did not make it into Northway, so they elected to retreat and spend the night. Someone from a local hotel was enroute to pick them up, so I hitched a ride and went to the same hotel. After I checked in I asked where was a good spot to have dinner. The desk clerk pointed to a little brown shack across the street and said that if I liked halibut, I needed to go there. I did. The food was prepared fresh and was only $12 for the meal. I picked up a bottle of Alaskan Amber Ale at the store close by, and had a great dinner of fish and chips to end the day. The day dawned with no rain and only scattered clouds. One large cup of coffee later, my fellow stranded pilots and I were back to the airport. 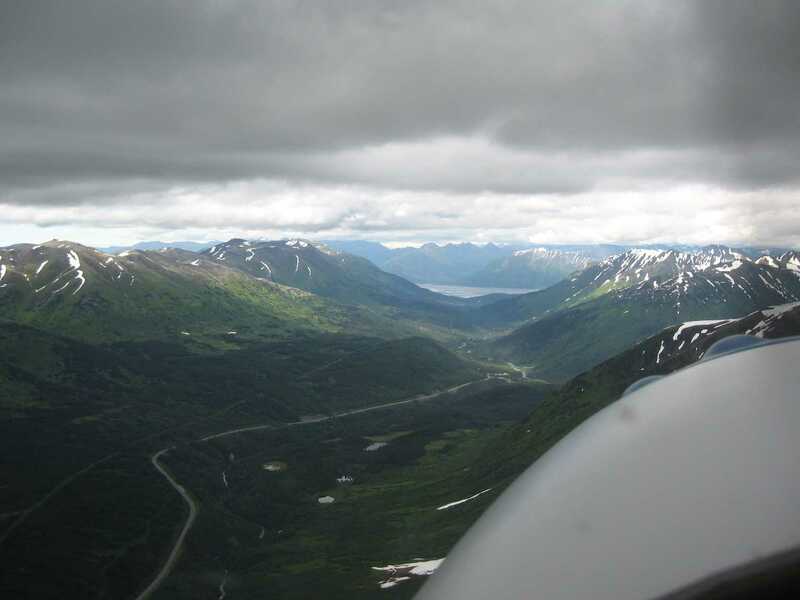 I planned to follow the Glenn Highway from Tok to Gulkana, then straight to Anchorage. It would be about a 2 and 1/2 hour flight. 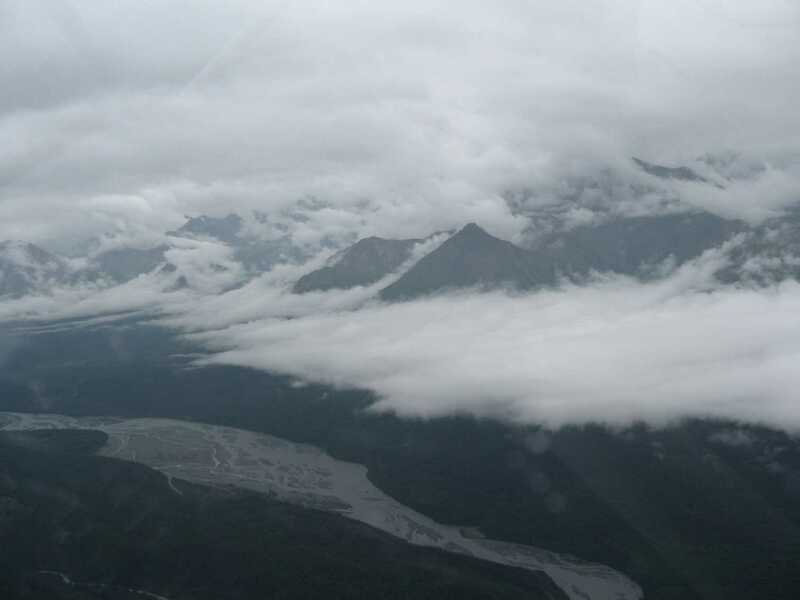 As I entered the valley, I could see that the clouds obscuring the peaks were not too high. My GPS said that the winds aloft were moving at about 45 knots, so turbulence in the mountains was likely. 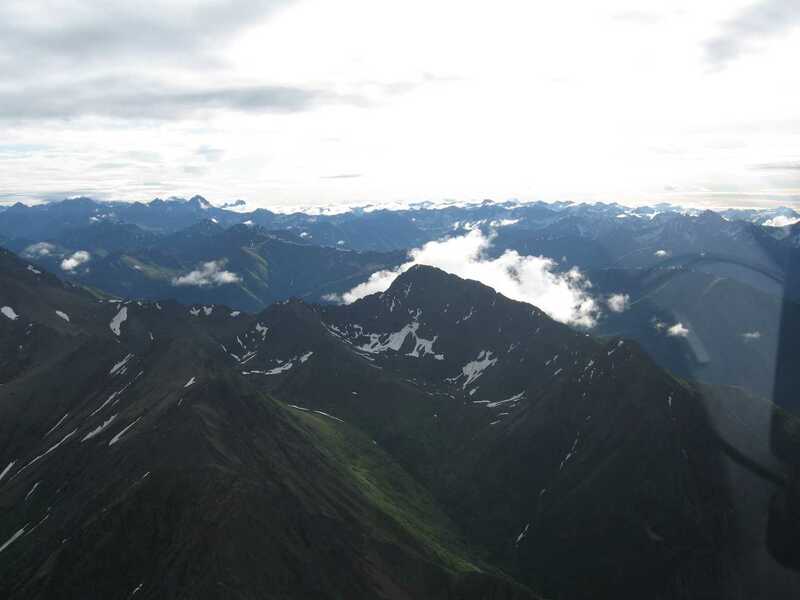 I could climb above them to 8500 and be above all the peaks except for the volcanoes in Wrangell St. Elias National Park. So I did and flew above the clouds in sunshine. By the time I got to Duffy's Tavern, all the clouds were gone. I dropped down so I could see the country and watch the Copper River going past. 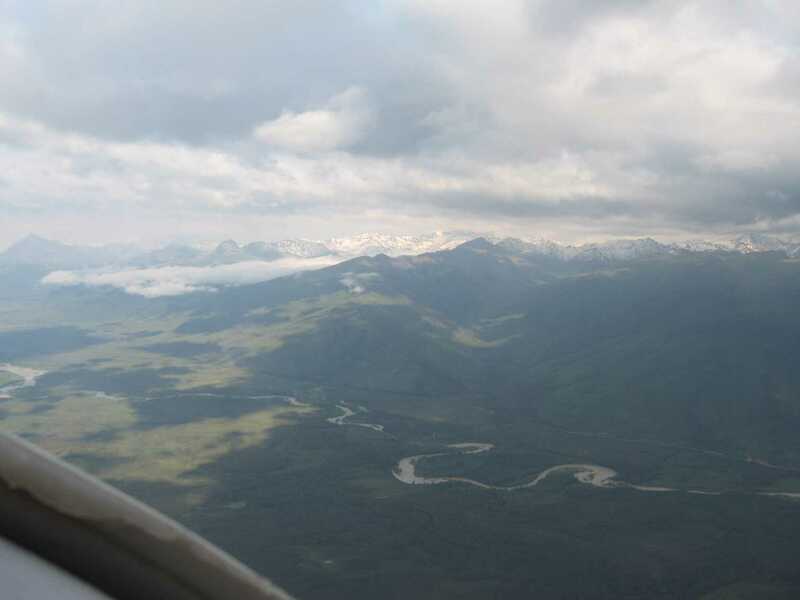 As I passed Gulkana, I flew over the Alaska Pipeline bringing oil from Prudhoe Bay down to Valdez. 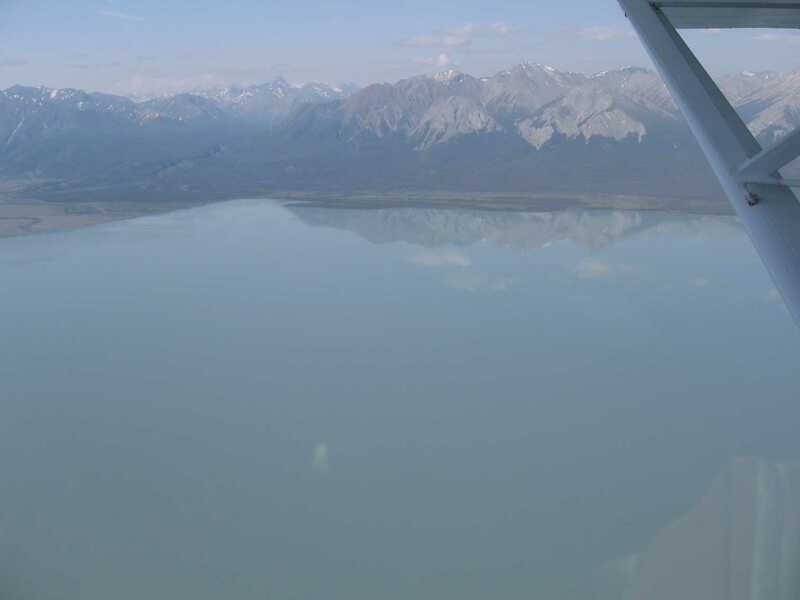 I was approaching a large lake that was a turquoise color from the copper deposits that had run into it. 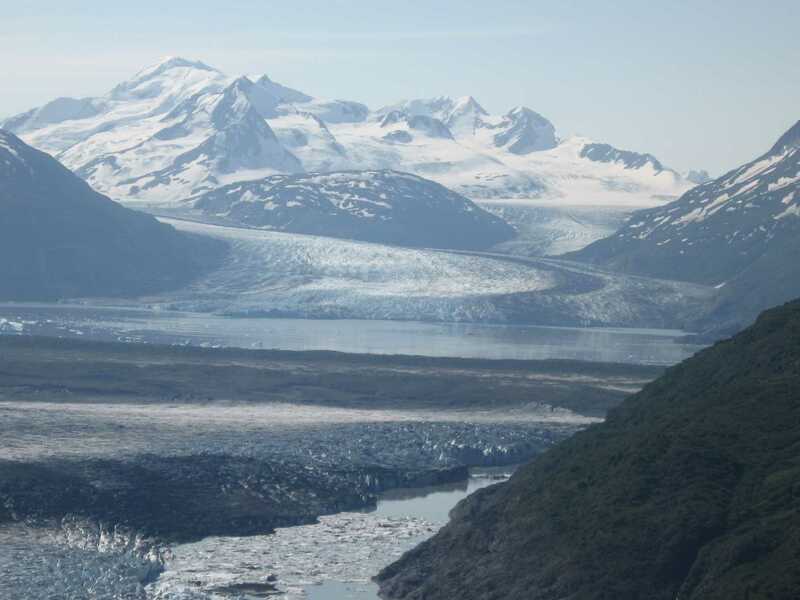 It was named Tazlina lake and I noticed that there was a glacier at the head of the lake. It was such a beautiful day that I decided I was not in too big of a hurry, so I had to go look. The lake was like a mirror and the glacier extended back farther than I could see. This is what I had come to see on this trip. 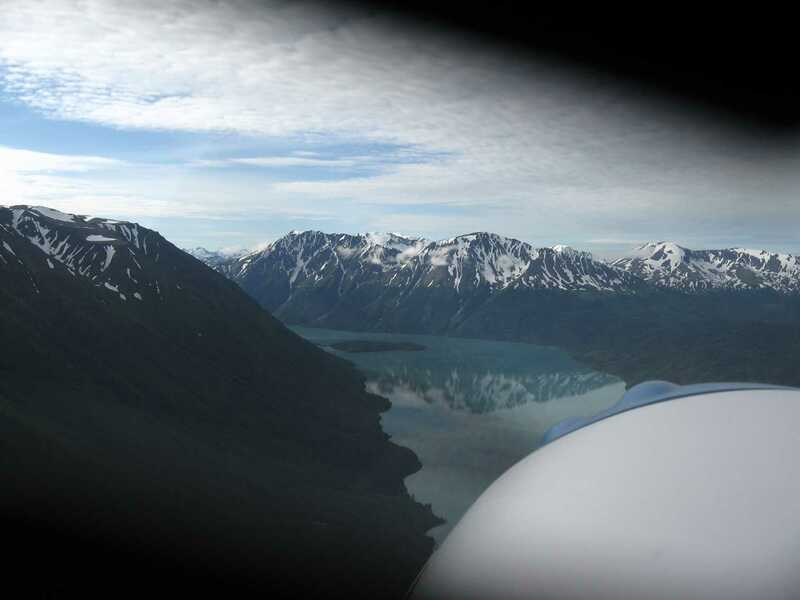 I circled the lake, flew along the glacier, and then continued on course. 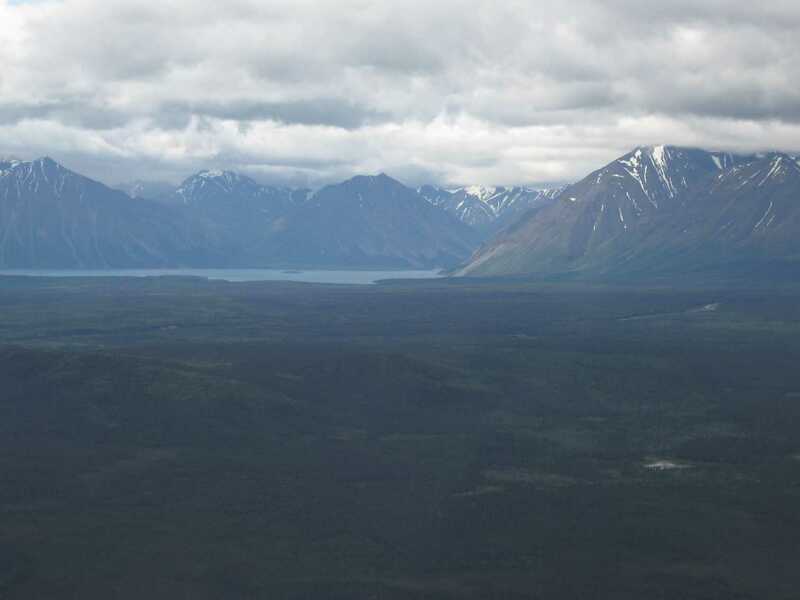 There was only one more area of mountains to pass through until I was in the Anchorage area. 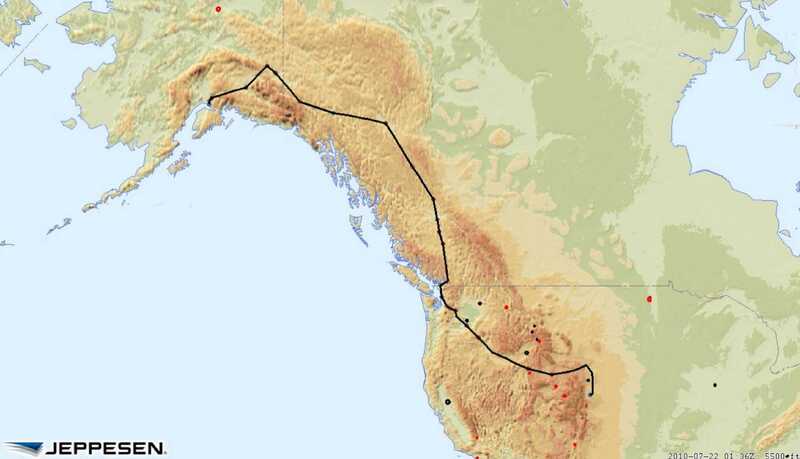 The route went through a pass near Sheep Mountain that I had read about in several of my books. It was a tiny pass that had claimed many airplanes over the years. I was glad that I had not attempted it in the crappy weather from yesterday. 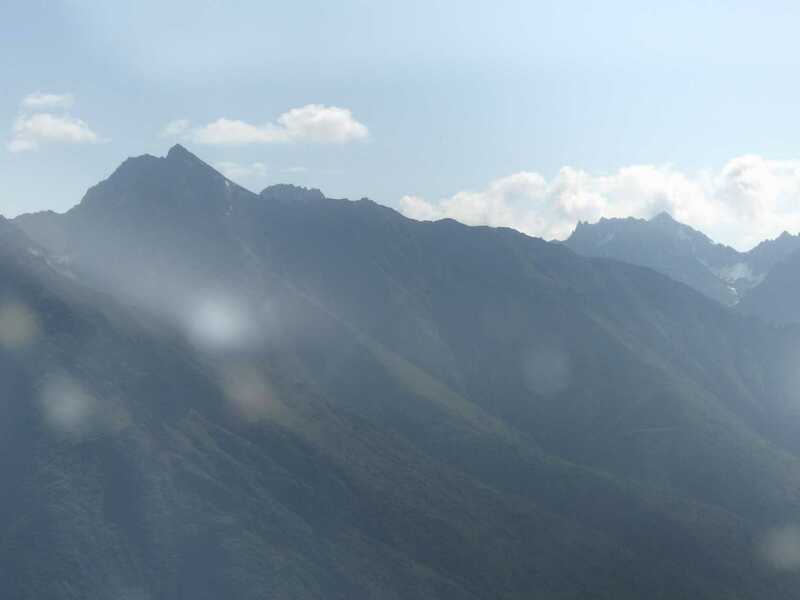 The weather-cam pictures that I had seen had only showed a sliver of clear air. Seeing it in the sunlight emphasized how big the mountain was along with how tight the pass was. I got a picture. The arrival into Merrill was fun. There is a whole lot of air traffic in the area with Merrill, the International Airport, Lake Hood, and Elmendorf AFB in very close proximity to each other. No Class B airspace existed. I suspect it is because so many aircraft in the state do not have transponders and are not interested in a retrofit. 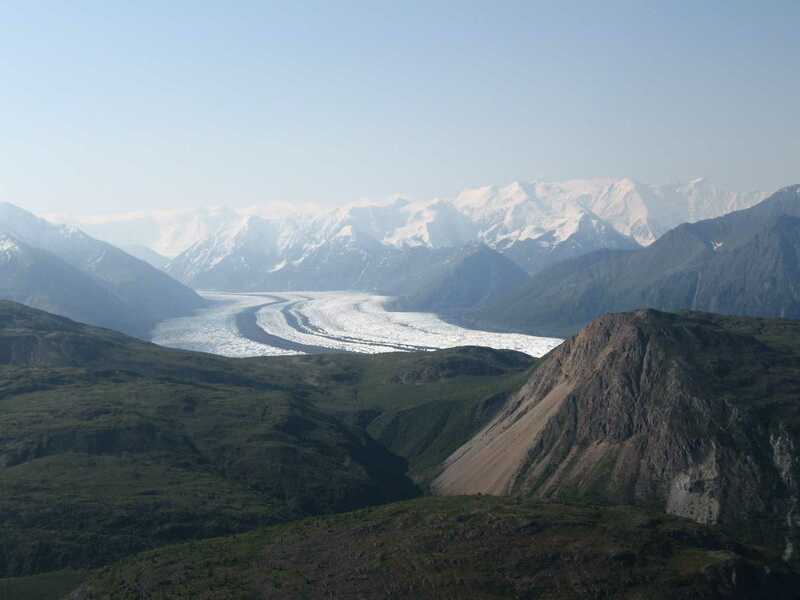 Therefore, special procedures specific to the area are prescribed under CFR Part 93 and published in the Alaska Supplement. 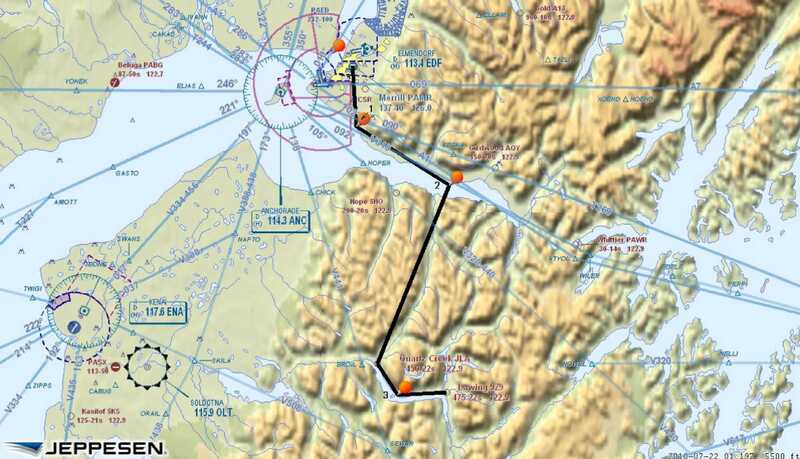 My procedures required me to fly at 600' over the Knik arm of the Cook inlet. A C17 Air Force cargo jet was passing above me as I approached the center of the channel. Small aircraft were arriving and departing in a constant line. 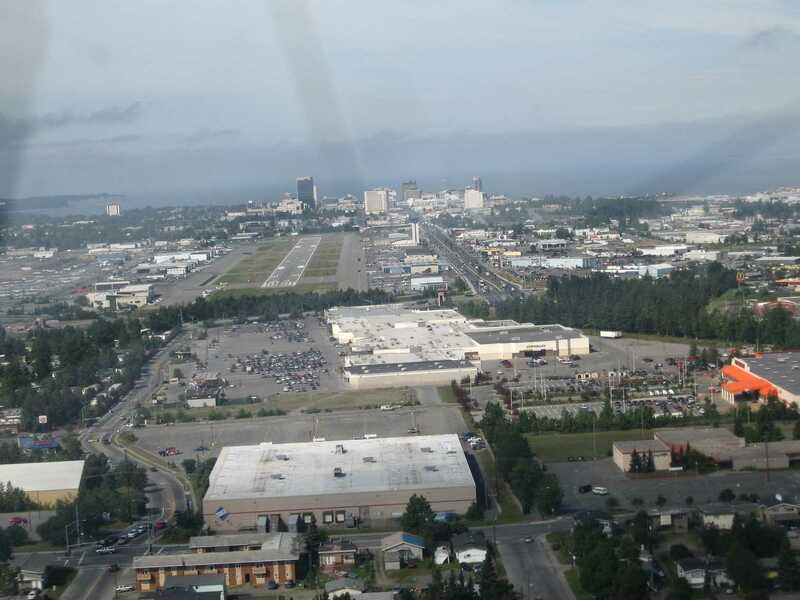 A call to Merrill tower received a right downwind for runway 25 and a landing clearance. I had made it. I taxied to Ace Hangars where I had reserved a tie down spot ($10 per night) and also booked a room for the week. Ace has hotel style rooms built right into the hangar. The room rate is only $110 per night - stay for six and the seventh night is free. This was significantly less than hotel rooms throughout town and had the added bonus of being right at the airport! The room was waiting. Free laundry facilities were included. Michelle, the hangar attendant, gave me a ride into town where I rented a car. Awesome! Arriving in Anchorage was a feeling of triumph. I had made it over a huge swath of the country. I was feeling proud and happy. I was also drained. I am glad that the next day was raining so that I could decompress. My mind was a bit mushy. The minor errands that I ran were about the limit of my abilities on that day. I changed the oil in the Kitfox because I had put 32 flying hours on the aircraft since leaving Denver. Most of the fuel that I had used was 100LL. The Rotax 912s prefers auto gas. Wednesday was different. 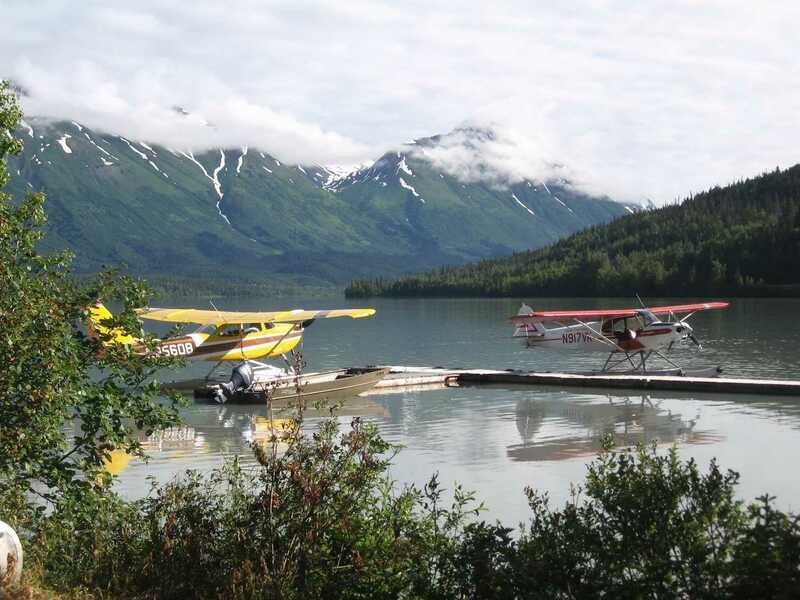 I had made plans to go to Moose Pass and fly with Alaska Float Ratings to get my biennial flight review. 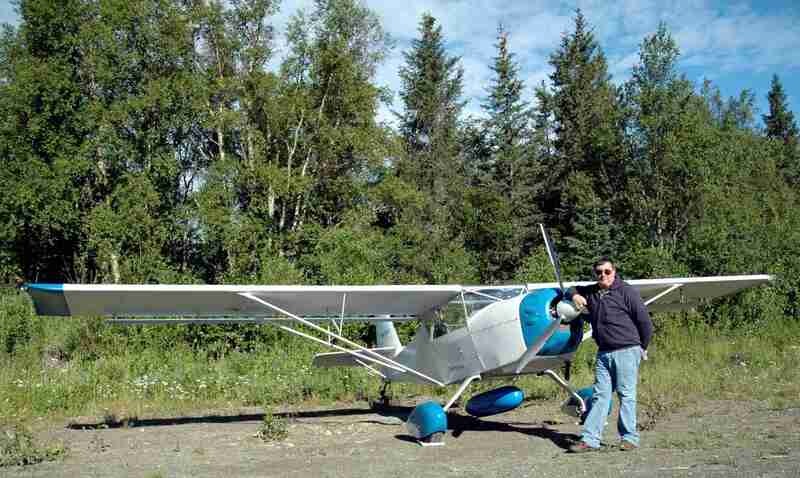 I had flown with them before and I really liked flying their Super Cubs off of Trail Lake. I have my seaplane rating but seaplanes are not permitted on the waters of Colorado. 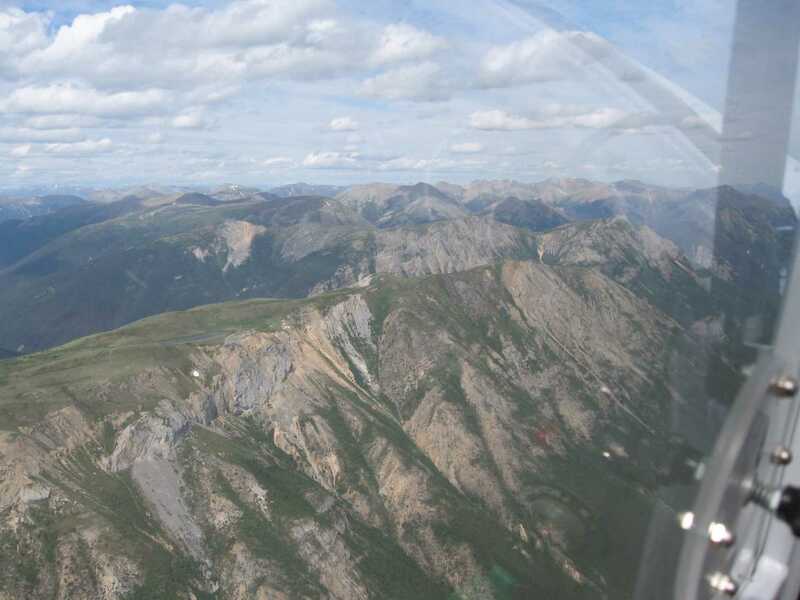 I was looking forward to flying the float planes, but even more exciting to me was the thought of taking the Kitfox through the mountains to the Lawing gravel airstrip near Moose Pass. In retrospect, that feeling was even more intense than flying off the lake. 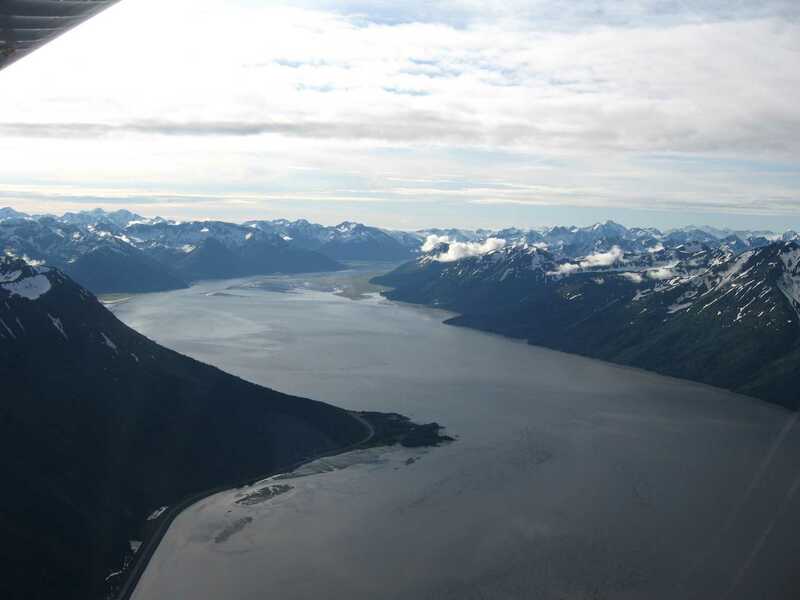 The flight from Anchorage to Lawing took me along (then across) Turnagain arm and over the Kenai Peninsula. This is a wonderful scenic flight. 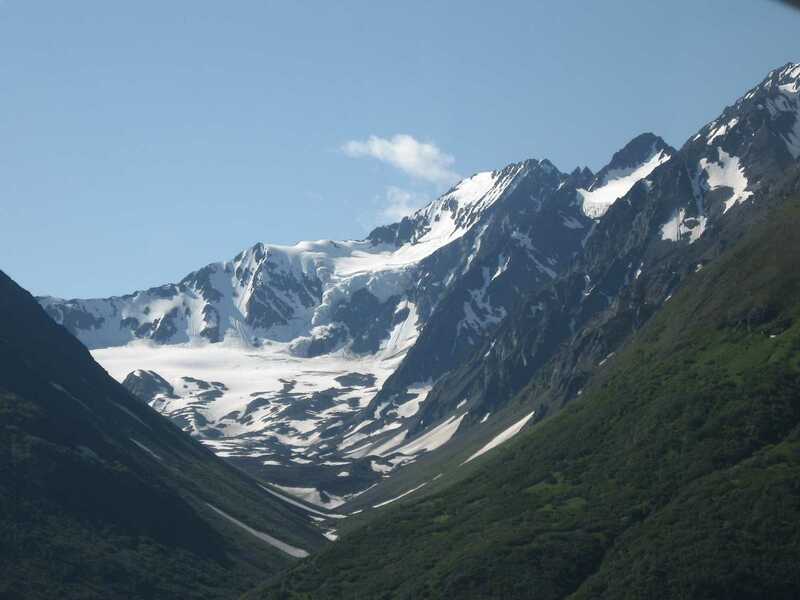 Stark mountains cut by glacial valley passes were contrasted by lakes, snow, and lush forest. 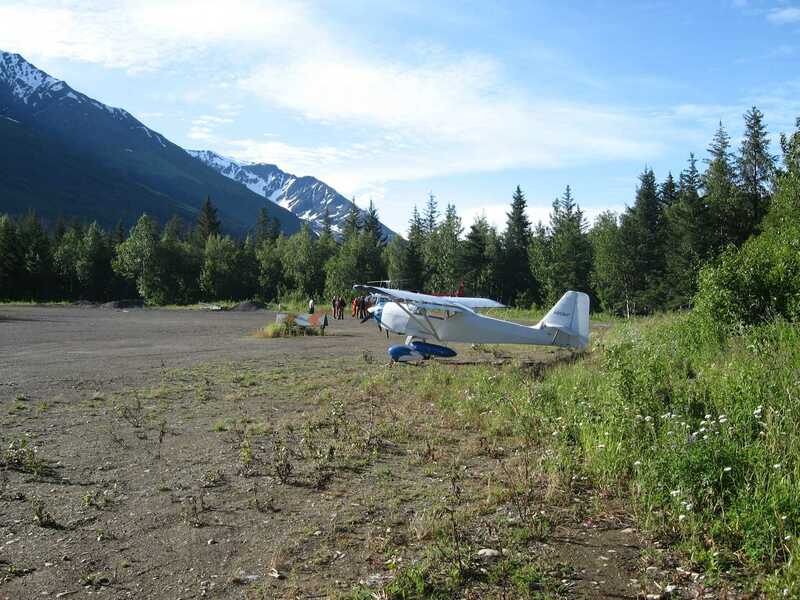 A turn at Kenai Lake led to the airstrip. The strip was 2200 feet long and cut out of a stand of tall dense trees. It was the true definition of the short field with obstacles at each end that primary flight training prepared you for. 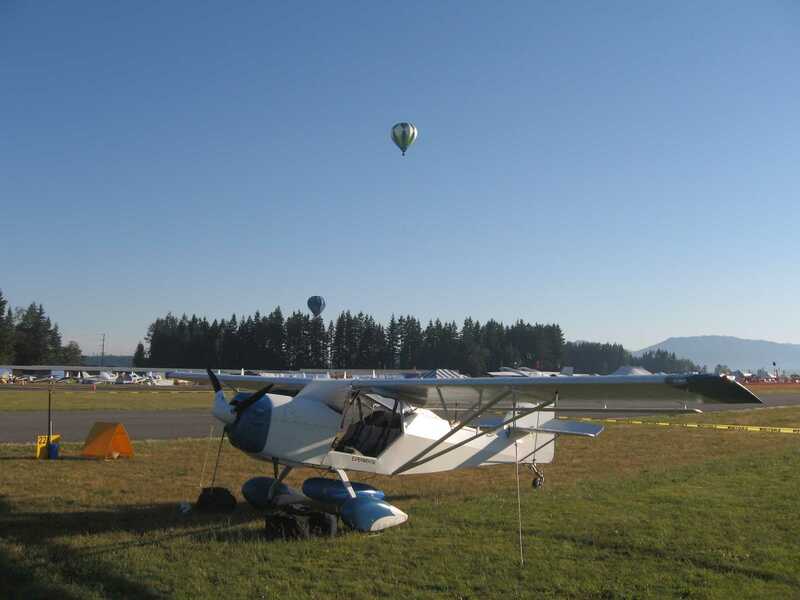 This was a perfect environment for the Kitfox. I actually cheered as I touched down. The people at Alaska Float Ratings are great. 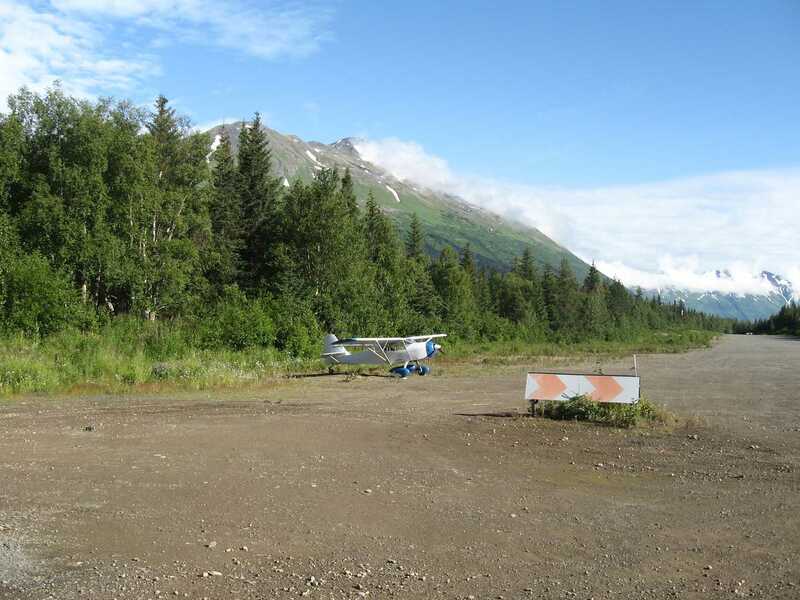 I had called them on their radio as I passed over Upper Trail Lake and they sent a car to the airstrip to pick me up. Vern Kingsford, the owner, is opinionated on most subjects and will be happy to share that opinion if you care to listen. 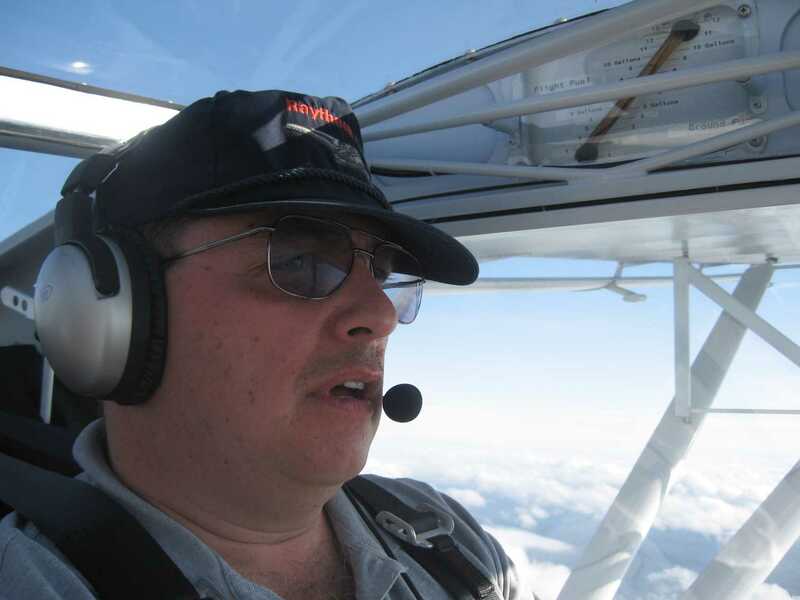 He is extremely knowledgeable when it comes to bush flying and float flying. He is also one of the most safety aware pilots that I have ever met. 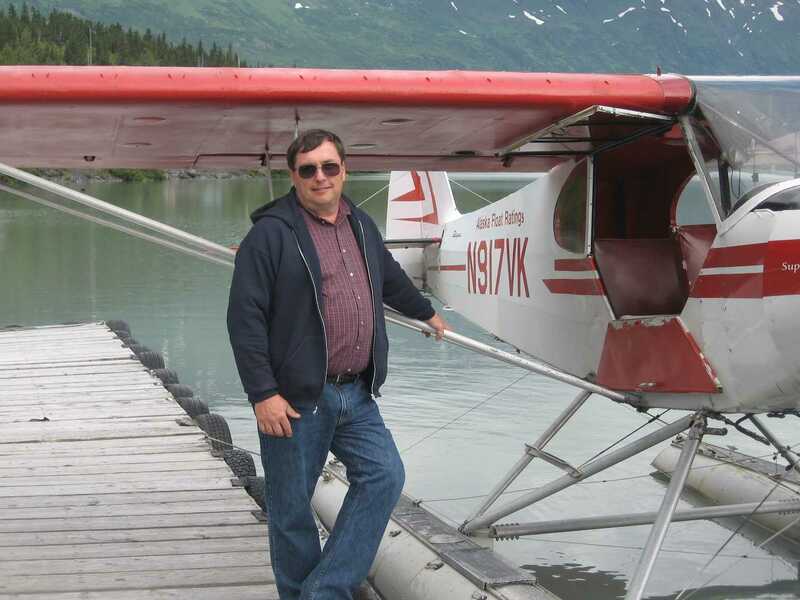 He preaches a gospel of training and energy management and eschews the macho legend of the Alaskan Bush pilot operating on testosterone and luck. One of his creeds is that, in an emergency, you do not rise to the level of the emergency, but instead rise to the level of your training. Good advice. Vern's wife Lura manages the operation. She is the brains behind the business. She is also very personable and pleasant. 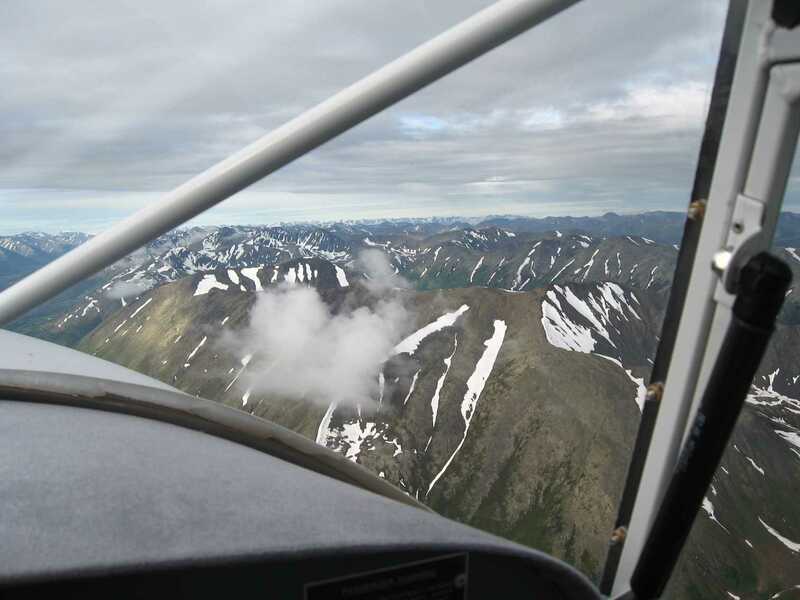 I spent several hours flying their Cub to different lakes in the mountains. That is the type of flying that dreams are made of. 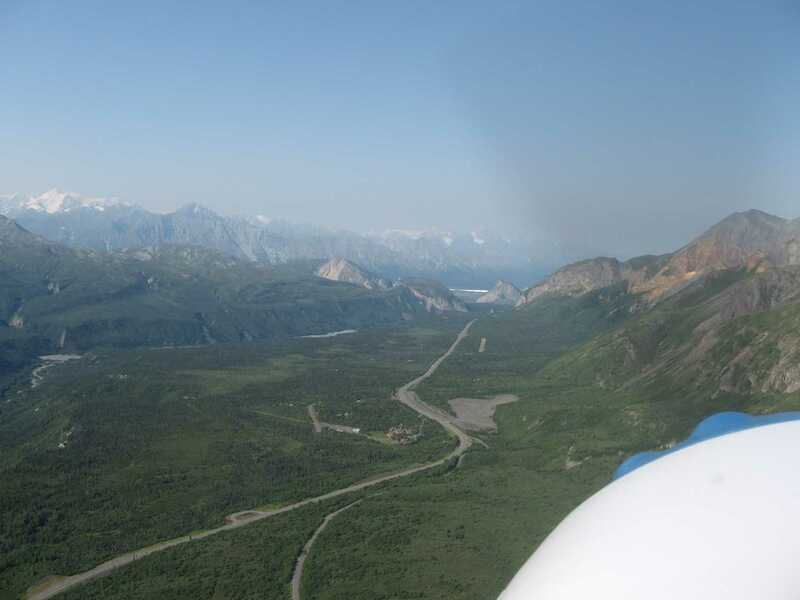 At the end of the day I flew the Kitfox back to Anchorage. The ride was uneventful except at the end when I tried to enter the pattern at Elmendorf instead of Merrill. The controller saved me on that one. My wife Sandy flew to town that night on the scheduled airlines to join me for a few days of tourist activities. She was happy to come to Alaska, but she does not share my passion for aviation. She wanted no part of the Kitfox journey. She did agree that the Ace Hangar accommodations were good, so that constitutes a resounding endorsement. 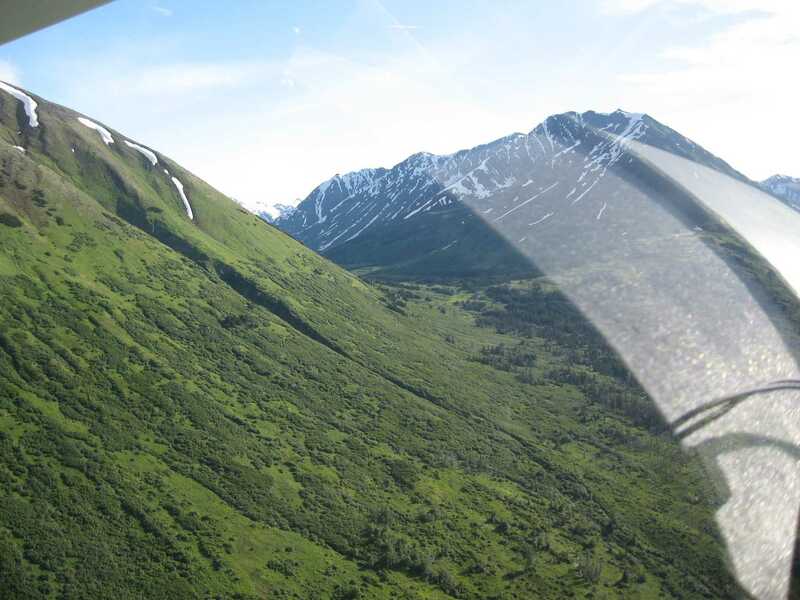 Kenai peninsula to Moose Pass	 Kenai peninsula to Moose Pass	 Turn at Kenai Lake	 Sheep country! This was to be a day of flightseeing with Sandy. She normally would not even ask to ride in a small airplane, but I assured her that the air would be smooth and the view memorable. 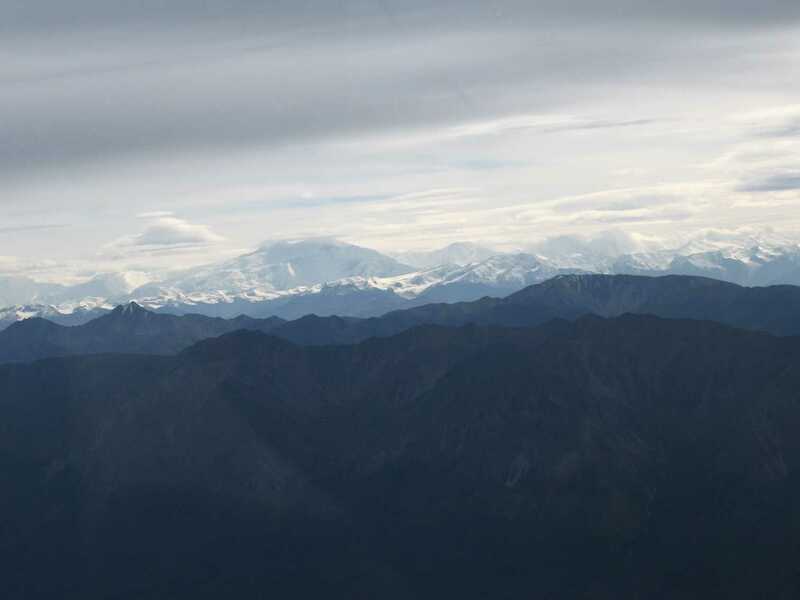 On all my previous visits to Alaska, I had never been able to see Mount McKinley. It was always obscured by weather. This day was different. 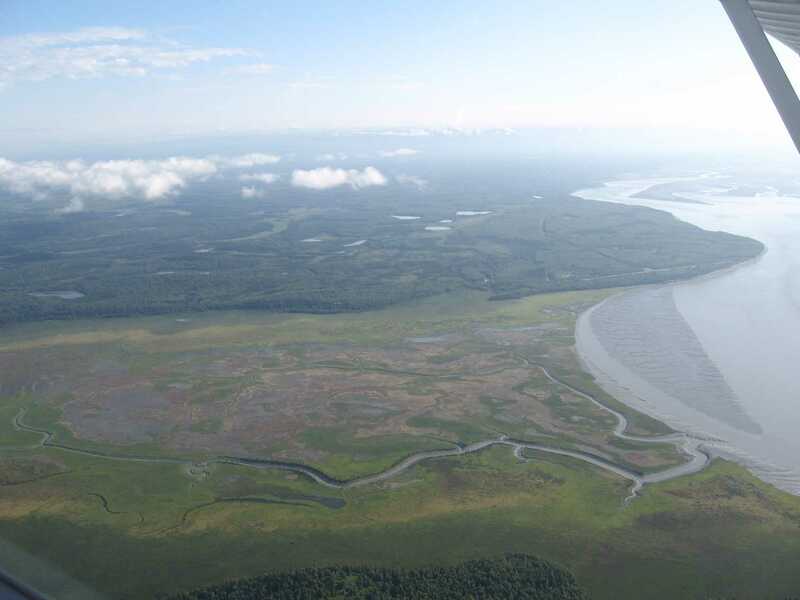 Sandy and I took off from Merrill and flew north across the Knik arm. We headed towards Talkeetna and the mountain came into view. There was an undercast layer, but the mountain extended well above those clouds. We finally saw McKinley. 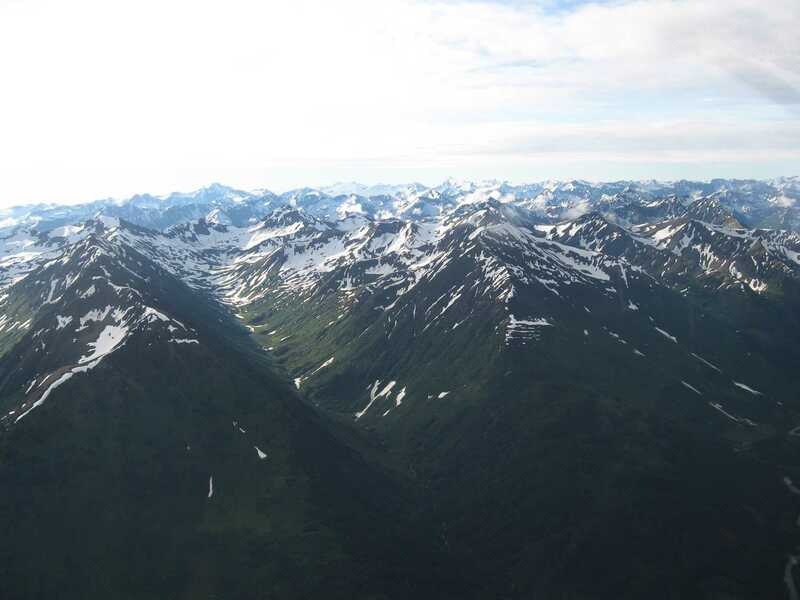 I turned the Kitfox back towards the Chugach Mountains where the sun was shining. It was a brilliant clear day. 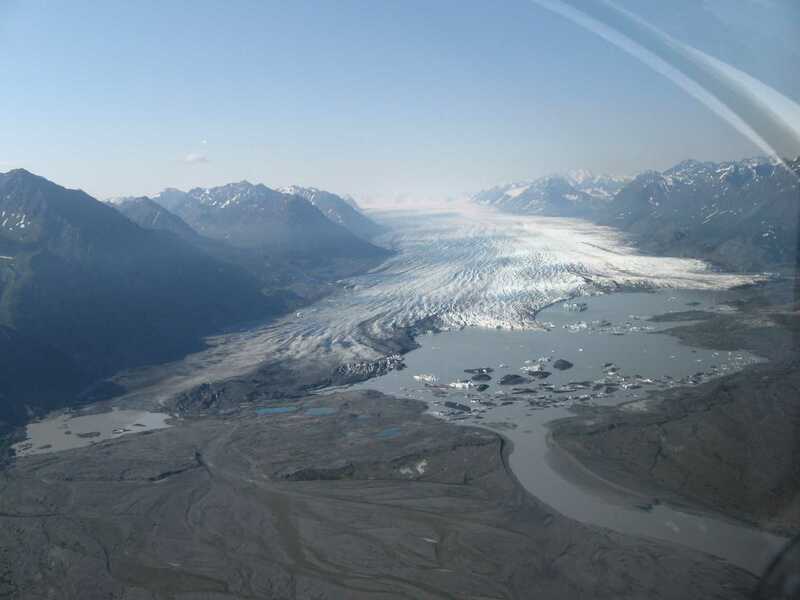 We flew over Wasilla and Palmer up to the Knik glacier. 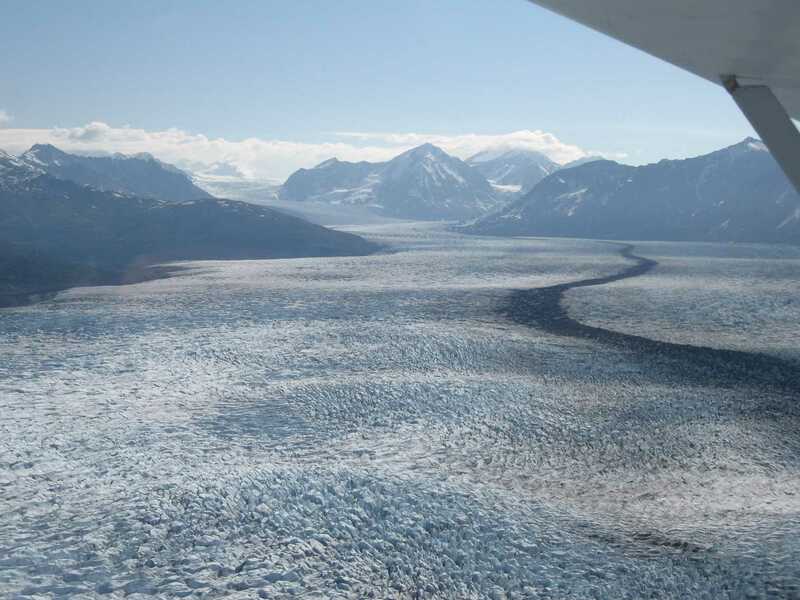 Flying over the toe of the glacier provided awesome views and great pictures. We returned to Anchorage where Sandy would catch an airline flight back to Denver. I planned to leave early the next morning and begin the trip home. The airplane was gassed and loaded - all ready to go. The next morning put a damper on my departure plans. Rain was falling so heavily that visibility was down to about three miles. 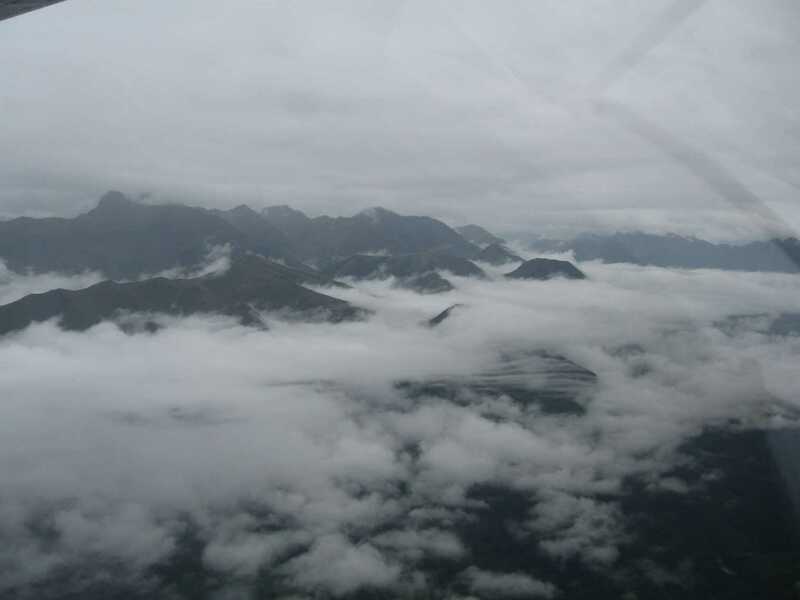 I checked the FAA's Alaska weather camera loops on the internet and found that VFR was in short supply. These camera feeds are a great supplement to the official weather. 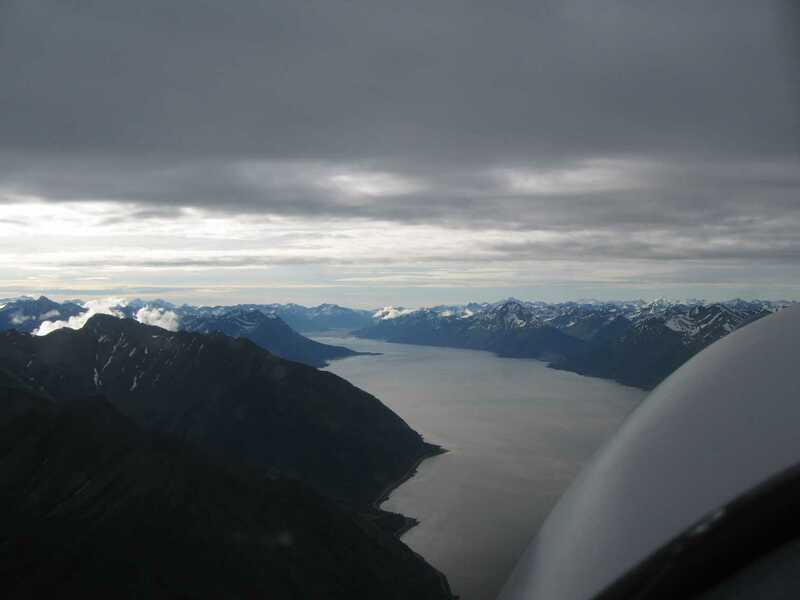 You can get a birds eye view of specific locations, especially mountain passes, to see if the conditions are conducive to flight. If it looks like a gray sweater has been thrown over the lens, you might think twice about committing aviation. 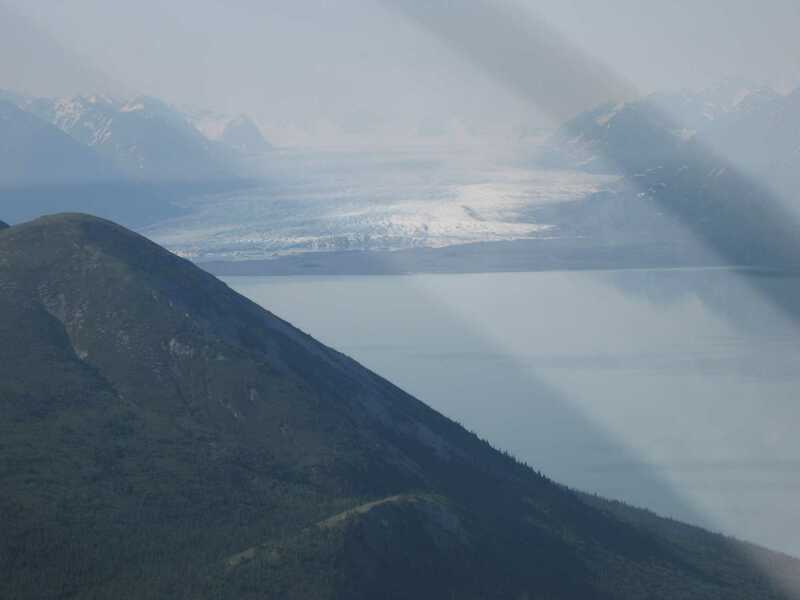 The cameras at Chikaloon and Sheep Mountain were gray. Time to read a book. At about 11:00 I noticed the sky was brighter and I could actually see towards the mountains. I could even make out the terrain on the camera loops! I elected to take off and have a look. 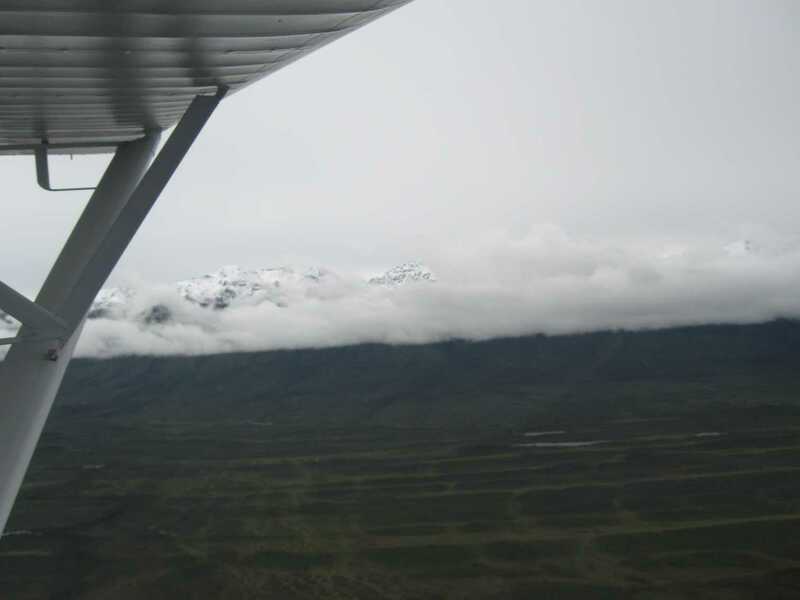 My initial departure stayed low to keep ground contact because rain showers were still prevalent. 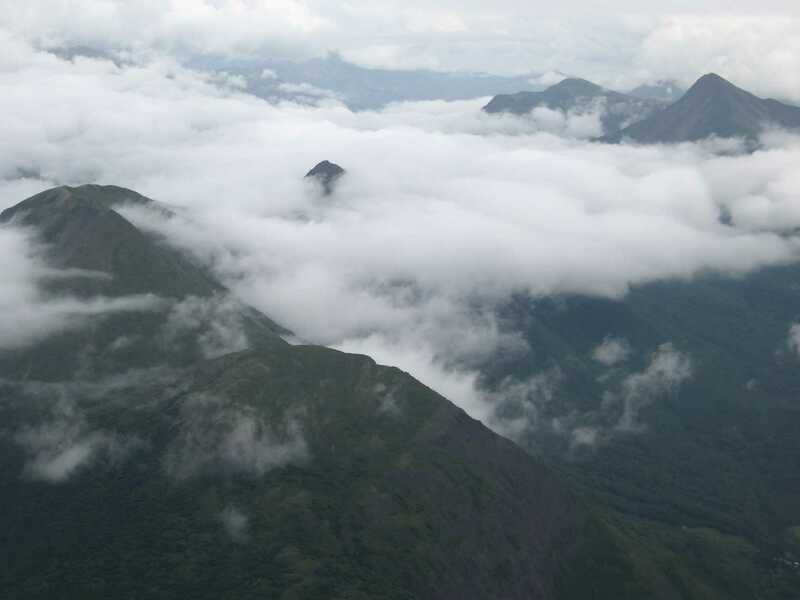 I made my way towards Palmer where I joined the Glenn Highway. Once in the valley, the weather improved and I climbed. 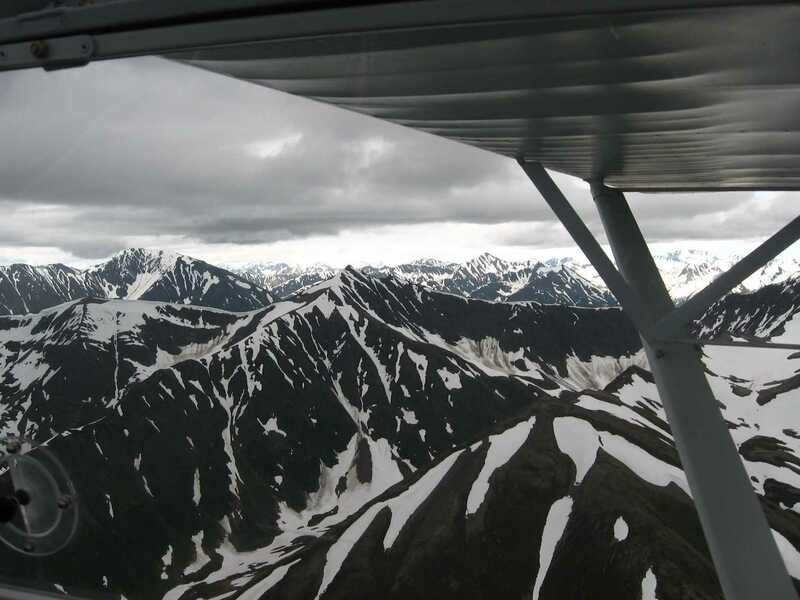 I had a good view of the surrounding peaks while flying above the lowest scud and below a solid layer. A light rain was constantly misting the windshield. 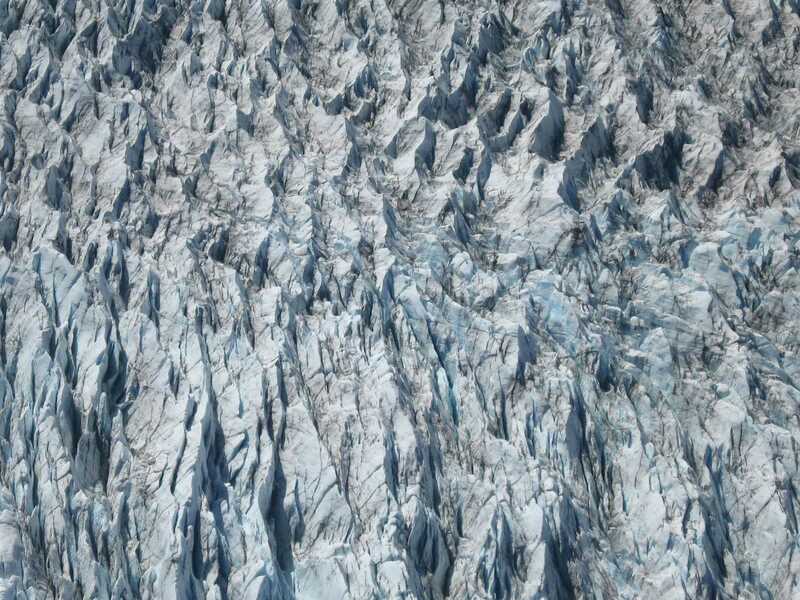 The mountains and glaciers were shrouded in torn wisps of cloud. It was beautiful. The further I went to the northeast, the better the weather got. By the time I passed Mahneta Pass, the sun was shining and the winds were blowing. I needed to stop at Tok to top the gas tanks before heading to Whitehorse. Essentially, I was reversing my arrival route and backtracking the way that I had come. 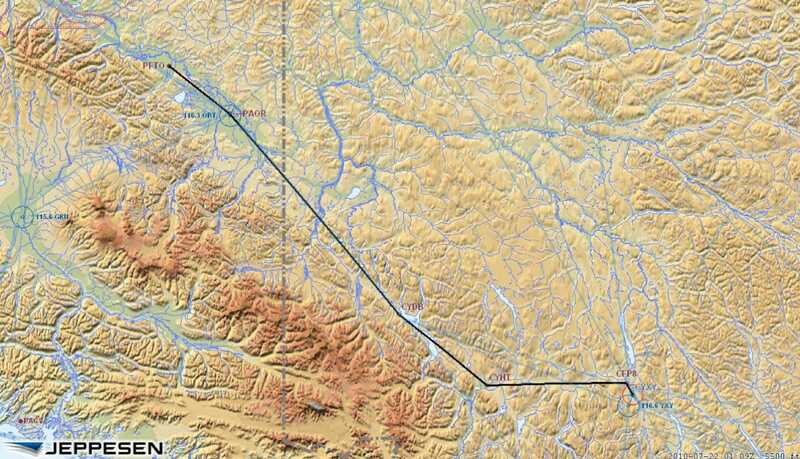 The only difference was that I was not going to fly south through the Trench, but stay with the Alaska highway all the way to its origin and then fly south through Alberta, Montana, and Wyoming. 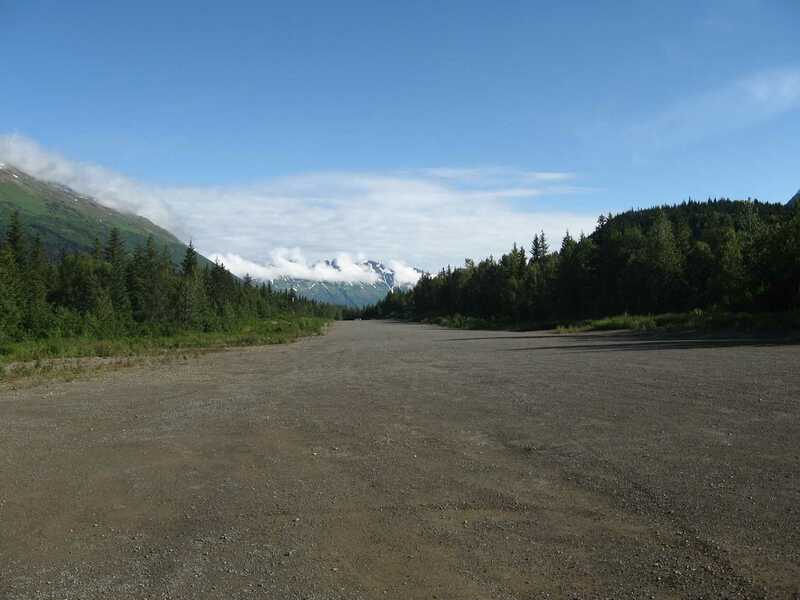 Tok has a single east/west runway. The wind was blowing directly across the runway at 20 gusting to 25. The air really got wild when I descended into the trees that closely surround the airport. I danced on the rudders and fought the burbles until I was safely on the runway. That is more than enough crosswind for my tastes. While fueling, a Cessna 182 landed in the same conditions and I really felt that the pilot was going to loose control and head off into the weeds. He let the downwind wing come up and the wind got under it. Only one wheel was on the ground - the wrong one. After a less than graceful recovery he finally got the airplane stopped. I don't know if he flew any more that day. I was tempted to take off directly from the ramp into the wind. It was well within the capabilities of the Kitfox. When I finally fired up and began to taxi out, the wind had shifted to a point where it was about 60 degrees off the runway instead of directly perpendicular. I lined up pointing diagonally across the runway, generally into the wind, and took off. What a great airplane! Once I got above the tops of the trees things smoothed out and I pointed the nose towards Canada. 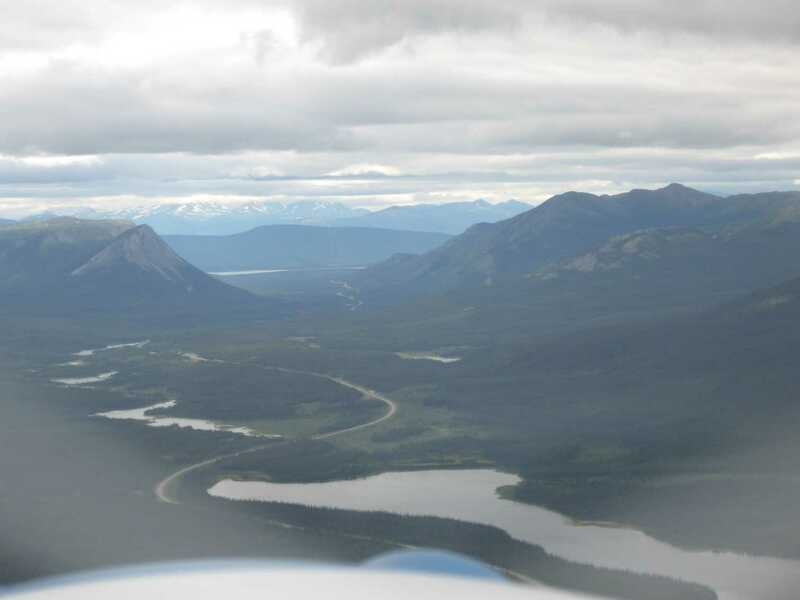 Weather was good for the entire flight and I once again landed at Whitehorse, this time to clear Canadian customs. The formalities were just as rigid as my previous arrival. A phone call to CanPass was all that was needed. I was going to refuel and continue to Watson Lake when I discovered that my tailpipe had cracked at the end of the muffler. I was unwilling to fly with hot exhaust gasses escaping into my engine cowling, so it was time to call a halt and get the crack repaired. I removed the muffler and took a cab to a hotel in town for the night. It was to be a quiet Sunday night in the Yukon. I went to the airport early to ask around about finding a welder. There was a large group of airplanes and pilots camping on the field. While waiting for the maintenance shop to open, I learned that this was an organized flight of about 100 general aviation pilots flying across Canada and getting filmed for a documentary. Whitehorse was the final stop. That night there was going to be a celebration banquet for the group and then they would split up and head for home. My preference in flying is for a little more autonomy and a little less formal structure. I located a welder who said that he would take the muffler into his shop in town and return it after lunch. He did. The courtesy and helpfulness of the people that I encountered cannot be overemphasized. The repair was performed for only $75. The local maintenance shop then let me use some of their anti-seize compound to reassemble the exhaust system. They gave me an Adel clamp to replace a broken one that I found restraining an oil line. I put the airplane back together and by mid afternoon I was airborne again. It sure is nice to have a homebuilt airplane where I hold the repairman certificate and can do my own maintenance. I landed again at Watson Lake for fuel and had to wait for one other airplane at the self service pump. There was a husband and wife in an older Cessna 182. They offered to let me fuel first because they said that they always had to battle with the self serve system. I offered to help so I was able to talk to them while I fueled their airplane. The gentleman expressed an interest in the Kitfox because he had originally thought about building an airplane then learning to fly it. His wife convinced him that he would be better served if he just bought a plane and learned to fly. He was 82 years old. He had been flying for three years when I met him. We both fueled, said our goodbye, and I took off again to follow the highway. I wanted to fly to Dawson Creek before sunset. This was the official starting point of the Alaska highway. I arrived while the sun was still shining at about 9:30pm. I did a wheel landing and, when I lowered the tail the airplane began to shimmy and twist. 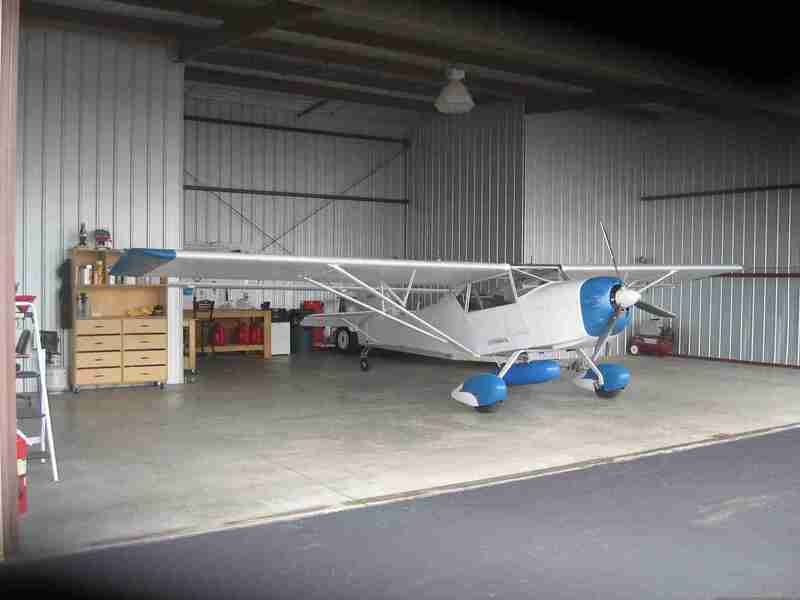 My tailwheel was flat. Looks like another delay. 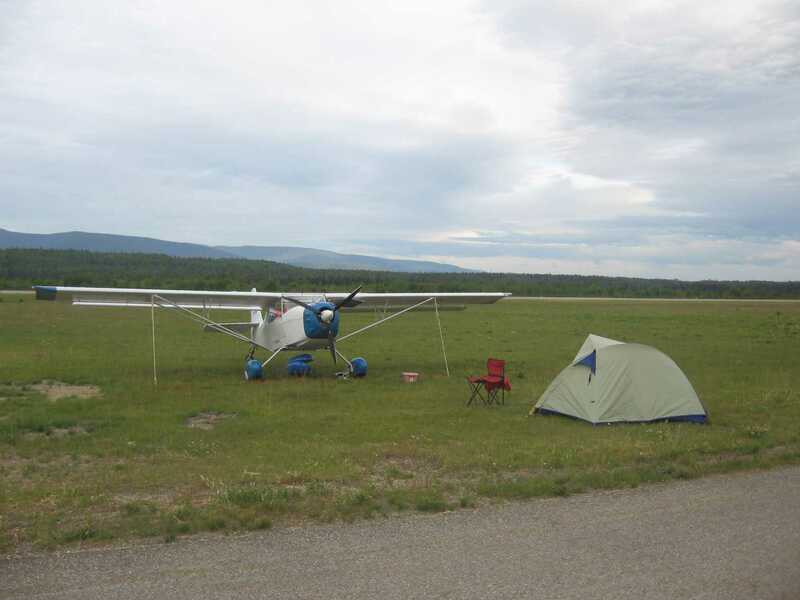 I had parked the Kitfox in the grass next to the taxiway and spent the night 'camping' on a lumpy couch in the pilot lounge. At least there were no mosquitos inside. The airport was all spruced up because there was going to be an airshow the next day. An F18 was parked on the ramp along with two A10's. I later learned that the F18 crashed two days later while practicing for his routine at Lethbridge. The pilot ejected and lived. The Snow Bird aerobatics team was expected to arrive later in the morning. Notams had been issued closing the airport beginning at 11:00, so I hoped to depart before then. If not, I was going to watch an airshow. I removed the tailwheel from the Kitfox, disassembled the wheel, and found a leak in the inner tube. I did not have a patch kit and I could not locate one at the airport. One of the Dawson Creek airport maintenance workers drove me to a tire shop in town. The shop repaired the tube and refused any payment. A quick trip back to the airport, once again put everything together, and I was flying by 9:00. I hoped to make this a long day in the air. 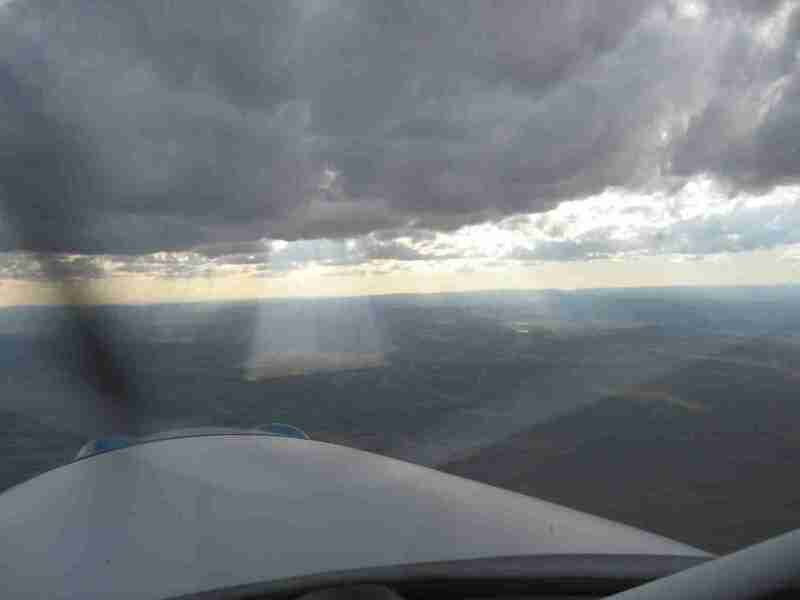 I stopped for fuel in the logging town of Whitecourt, snaked through towering cumulus all across Alberta, talked to the NavCanada controllers as I flew through the TCA at Calgary, flew past Lethbridge, and finally landed in Cutbank Montana to clear customs. US Customs and Border Patrol was a little more formal than Canadian customs. This is the direct result of the attacks which occurred on 9/11. As a pilot, I was required to file advance information via online access - no phone calls - every time I left or entered the country. A total of four of these EAPIS filings were required during the trip. I also had to be on a flight plan when I crossed the border. Additionally, I had to phone the local Customs agent to make an appointment for when I would arrive at the airport. In Cutbank, I was asked to show my passport, pilot license, medical certificate, and aircraft registration. I had to fill out an inbound declaration form and was asked several questions about what I was carrying. The aircraft was checked for a valid CBP sticker and examined with a Geiger counter for radiation. After all of that, I was permitted to remain in my home country. A tank of gas and I am on my way again to spend the night in Billings Montana. As I get ready to depart Billings, I am in familiar territory with only 400 miles to go. In my life as a charter pilot based in Casper Wyoming during the early 1980's I had often flown in this area. I could actually make it all the way home from here without charts or GPS based on the familiarity of the landscape. A few homebuilt aircraft are on the ramp getting gas as I prepare to leave. They are on a pilgrimage to Oshkosh which will start in just a few days. 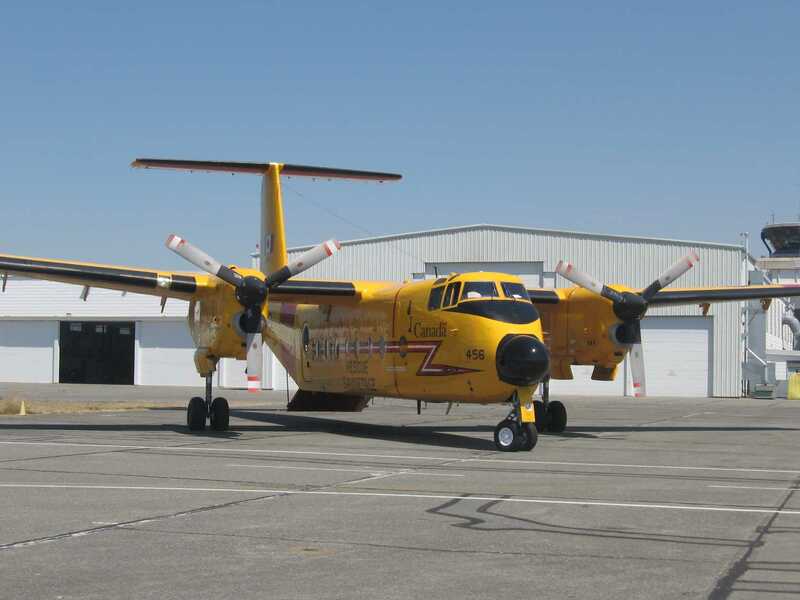 One is a BD-5 who had experienced an engine failure and glided to a landing on the airport. Lucky pilot. There is not much wing area on the BD-5 so I imagine the glide ratio is comparable to a lawn dart. I fight a twenty knot headwind as I cross Wyoming. Not only does this prolong the flight, but it means that I will have to stop for gas once more before I get home. As I pass west of Casper, I listen to the tower on the radio. This is where I started my career as an Air Traffic Controller in 1983. As I calculate the fuel reserve, I decide that I will land in Greeley and add five whole gallons before I continue to FTG. My personal minimum is to always have one hour of fuel left in the tank when I reach my destination. I am not too proud or too stupid not to stop 30 miles short to ensure that my minimums are maintained. I am determined not to end my flying career by something as preventable as running out of gas. Thunderstorms begin to form as I approach the Colorado border. I pass between two well developed storms over Laramie and Cheyenne as I descend into the front range. After the gas stop, I keep low to avoid the Denver Class B airspace and notice that the mountains west of Denver are purple with storms. When I talk to the controller at FTG, he tells me the storms are moving east off the mountains and will be arriving soon. I land at FTG and have the Kitfox in the hangar before the rain begins. I will have to drive home in a torrent, but the airplane is secure. I have flown a total of 64.3 hours in the Kitfox on this journey. 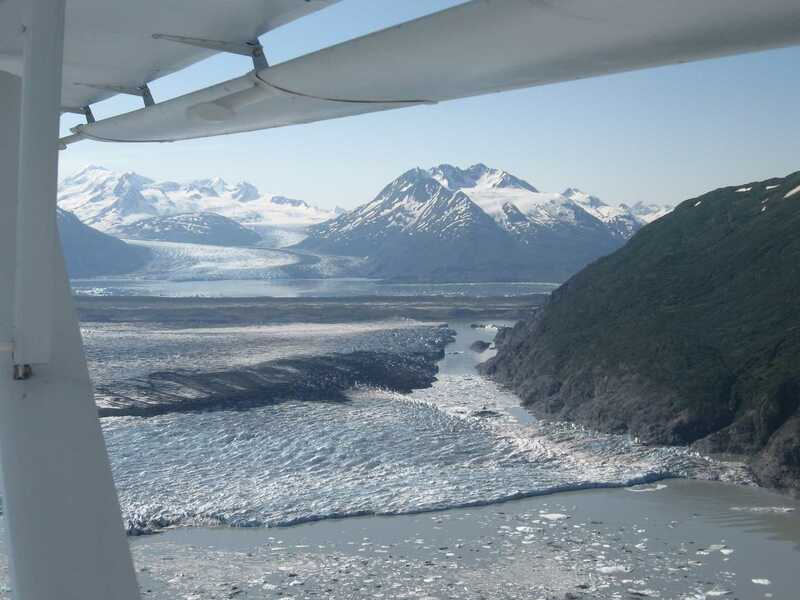 Some of it was local flying while in Alaska, but most of it was the journey itself. I encountered minor delays for weather and mechanical difficulties, but I had built slack into my schedule to cover such eventualities. The cost was much more than taking an airline, but the reward was so much better as well. As I stated at the beginning of the trip, it was not the ultimate destination - the journey was the destination. Many acquaintances questioned my motivation and even my sanity for embarking on such an endeavor. I was asked 'were you ever afraid...?' In all honesty I was not. After the trip had ended, I encountered a passage on the book 'True North' written by George Erickson which expressed my feelings on this issue. Mr. Erickson wrote "Flying alone doesn't worry me. I trust my equipment, my training, and common sense. And though solo travel has its hazards, what good are our dreams if we lack the courage to follow?"